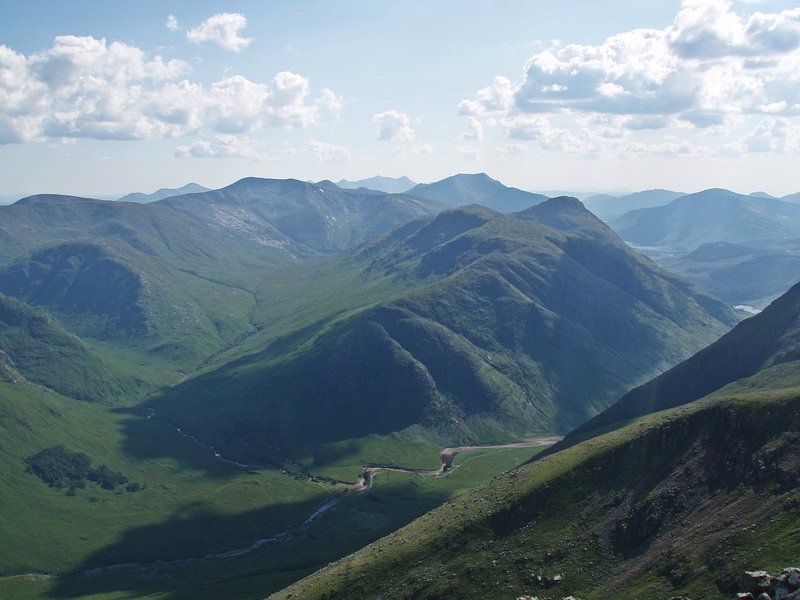 A couple of hot and sunny days were the perfect “excuse” to spend two days in Glencoe on interesting routes and collecting some Munros and Tops on the way. 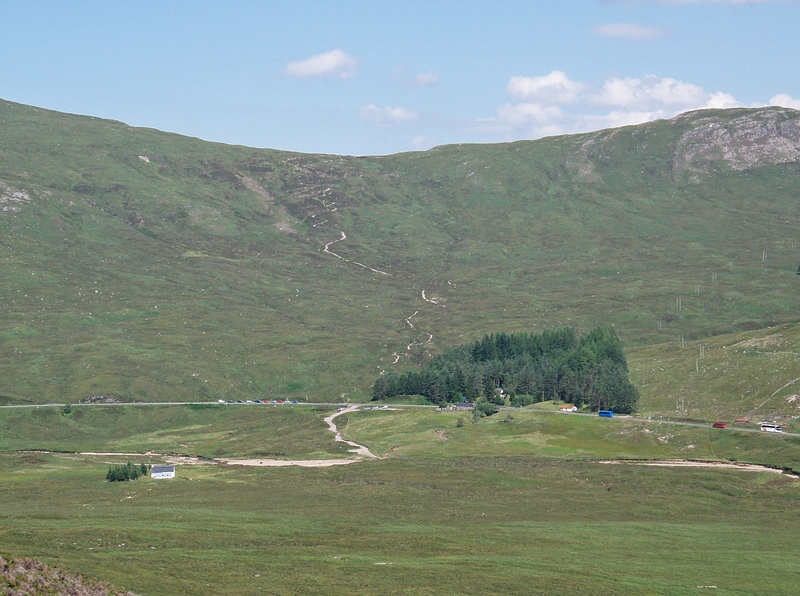 Due to the nice weather and my usual late start, the lay-by at Altnafeadh was already full when I arrived, but I easily found a space in the car park one km further W where I would finish my walk later in the evening. 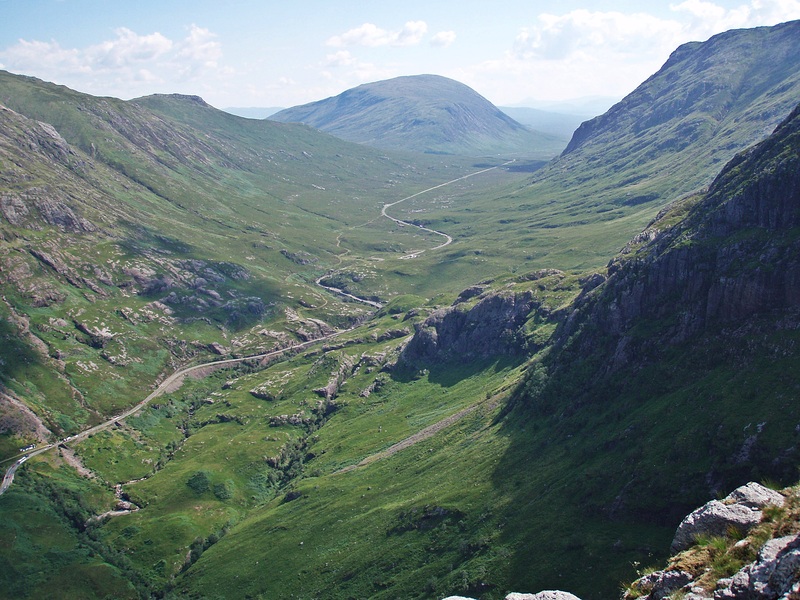 I didn’t feel very safe walking along the A82 with its heavy traffic, so I left the road as soon as possible, forded the shallow River Coupall and headed across to Lagangarbh where I joined the path. 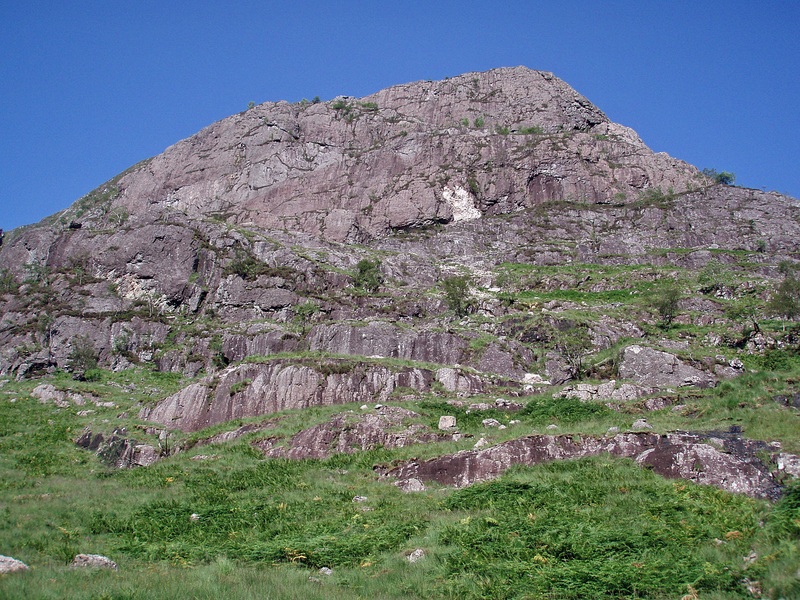 The Devil’s Staircase above Altnafeadh. 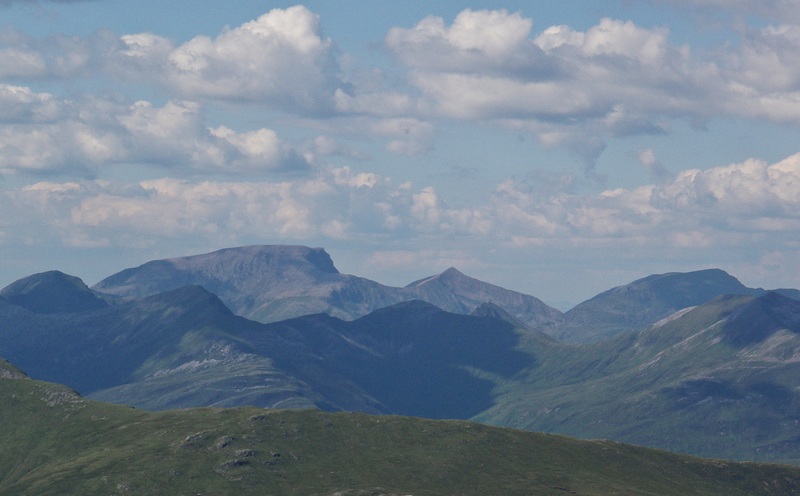 Ben Nevis and The Mamores. Finding the start of the route can be a bit confusing, and I remember the first time I did it I just followed some other walkers who seemed to know the way! 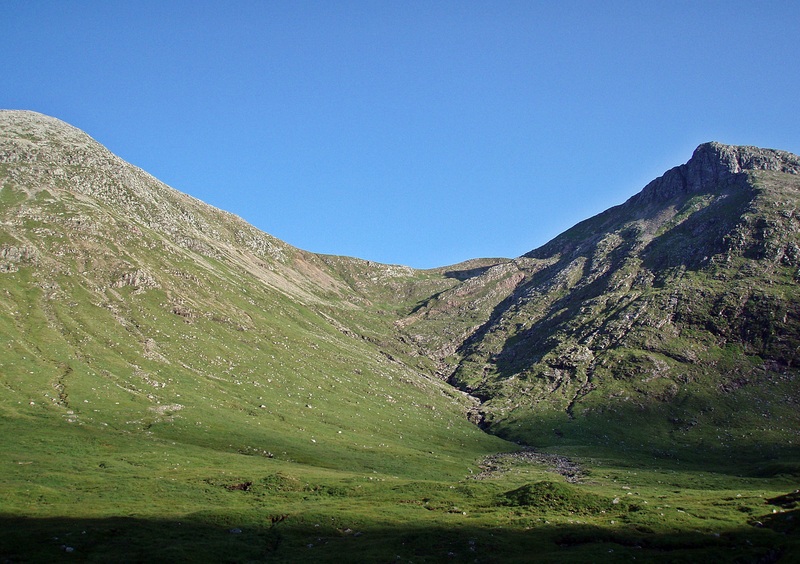 Where the path from Jacksonville joins from the left, a wide slope with various scree paths through it leads to the start of Curved Ridge. 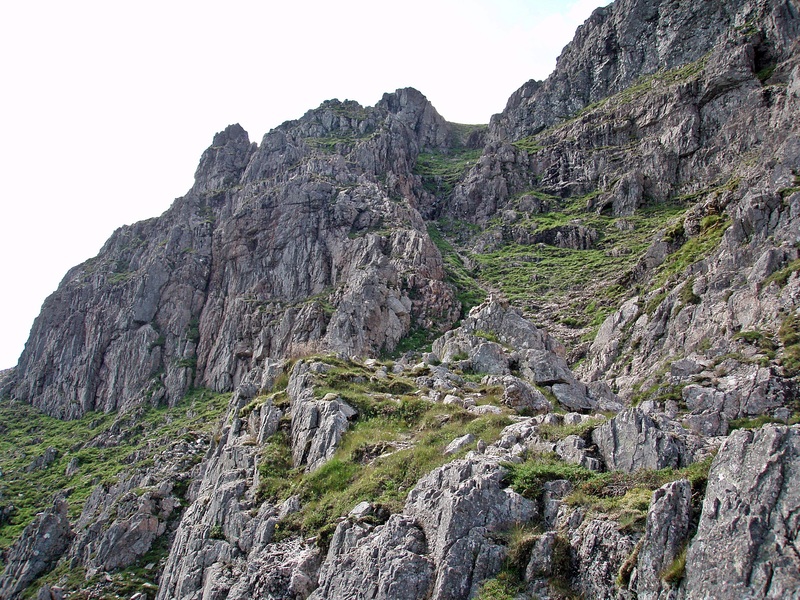 Once past the scree it is important to traverse to the right as the continuation to the left leads to more difficult terrain and other climbing routes. 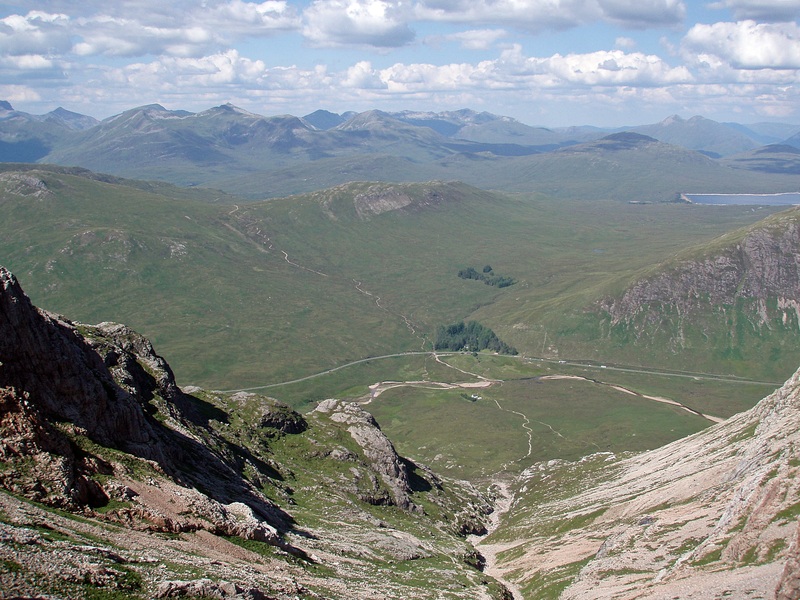 Below Rannoch Wall (on the right) I was passed by another walker, and after he dislodged a small rock I decided to stay behind and wait until he was out of sight before I followed him further up. 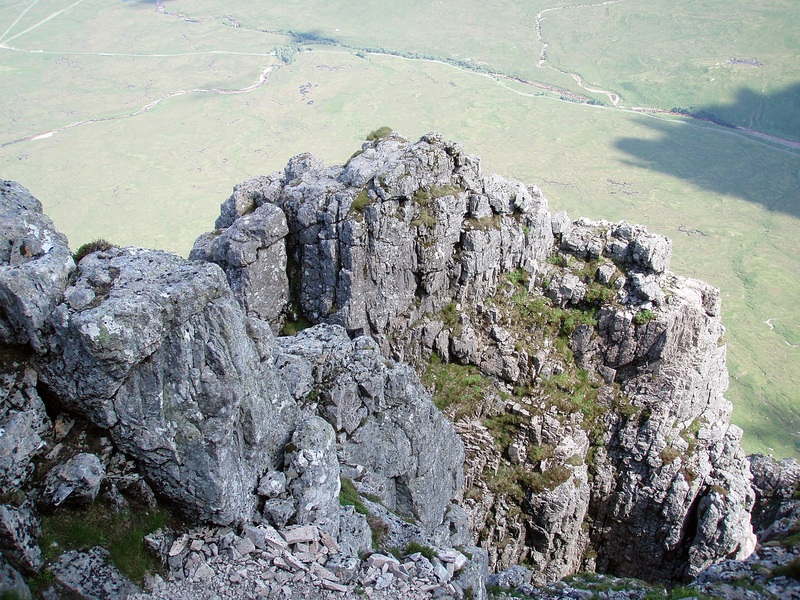 Looking down I could see more walkers coming up, it later turned out to be a father with his young daughter – I think she was only nine years old and did really well (they even arrived at the summit before me but they omitted Crowberry Tower)! 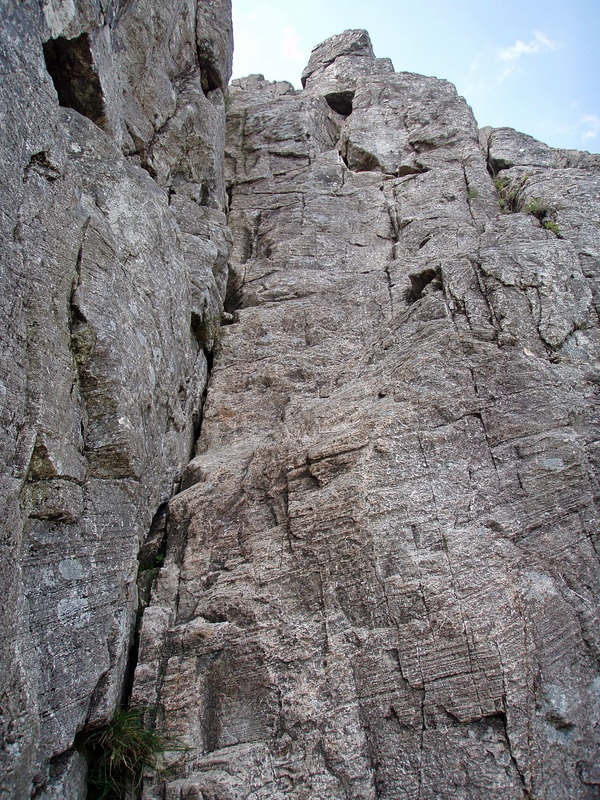 … and steeper, and at this point I made a stupid mistake: There are plenty of holds but the rocks are near vertical and feel quite exposed. Trying to find the best line, I traversed a few steps to the left and suddenly found myself in an awkward position, with my right side against the rock instead of facing it. 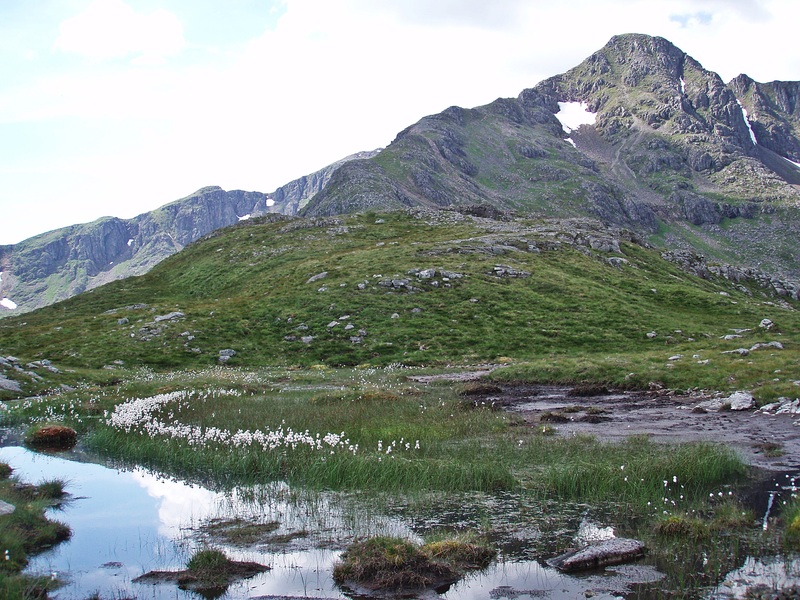 I knew I had to turn around but felt I couldn’t because any movement would throw me out of balance, and for a few moments, standing on tiny ledges and feeling the muscles in my legs becoming tired, I felt panic building up. I tried to calm down and convince myself that I could do this (as I had done this route a few times before) and somehow I managed to reverse the last steps and get into a safer position. 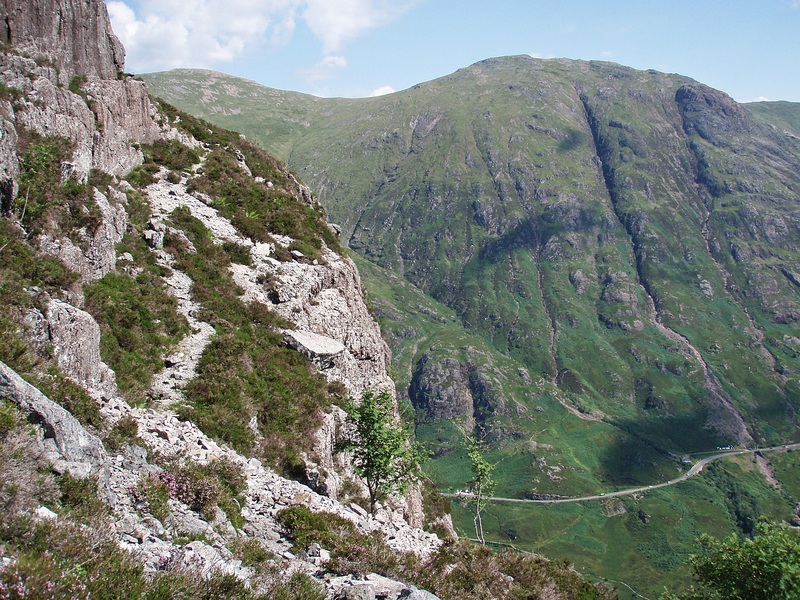 I hope I don’t put anyone off attempting this route, it is really not technically difficult, it’s only the exposure that makes it harder than, for example, the Aonach Eagach (in my opinion). Normally I manage to just concentrate on the next steps ahead and not look down and think about what could happen, but this one time I forgot this rule for a few minutes. 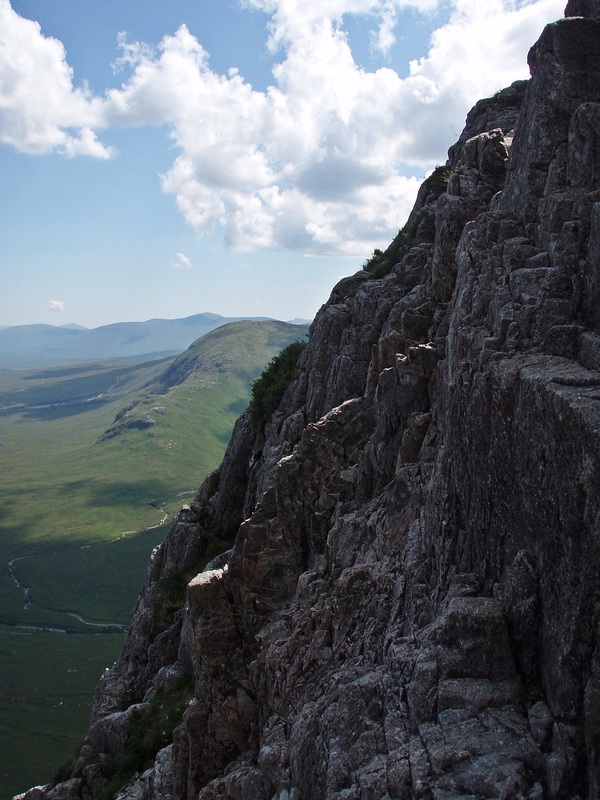 Rannoch Wall to the right – now that is steep! 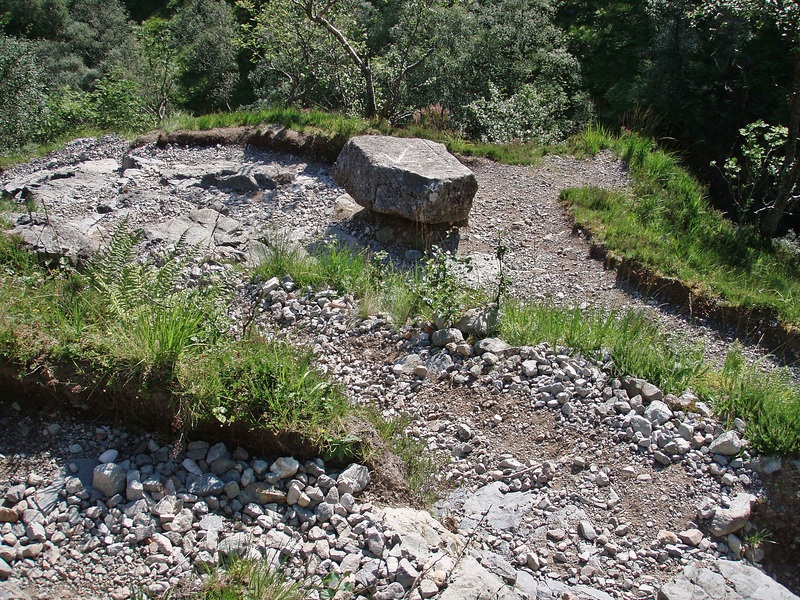 One of the less steep sections, consisting of large rock steps. 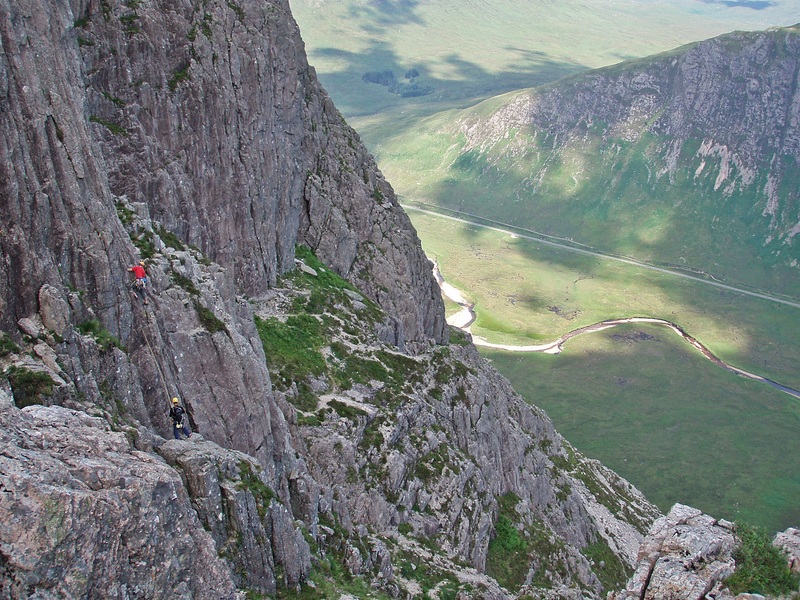 Rock climbers on Rannoch Wall. Between the “almost-vertical” sections there are small platforms where it is possible to sit and relax for a while and enjoy the views. 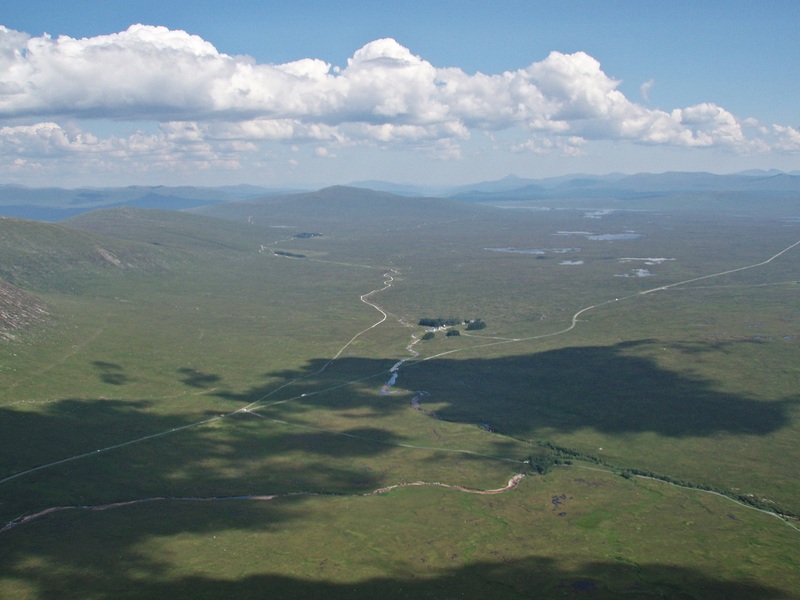 Rannoch Moor and the Kings House Hotel. 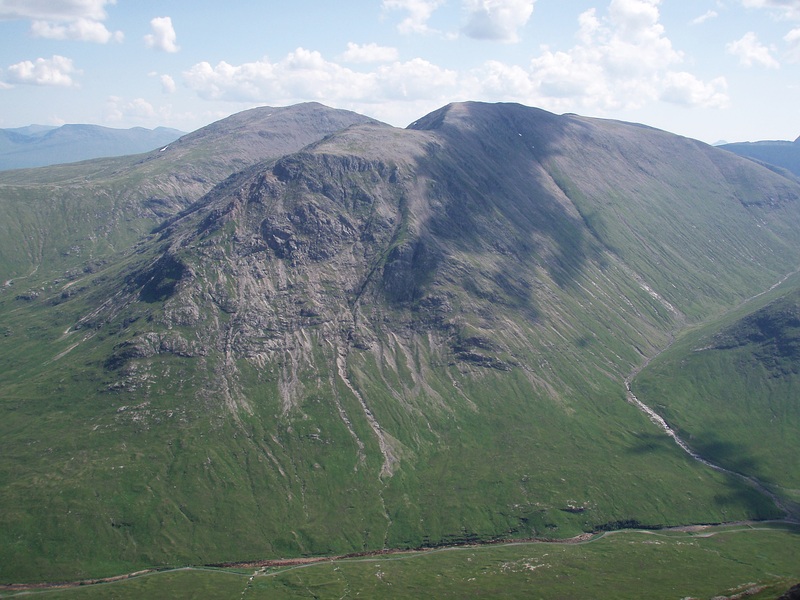 Creise and Meall a’ Bhùiridh. 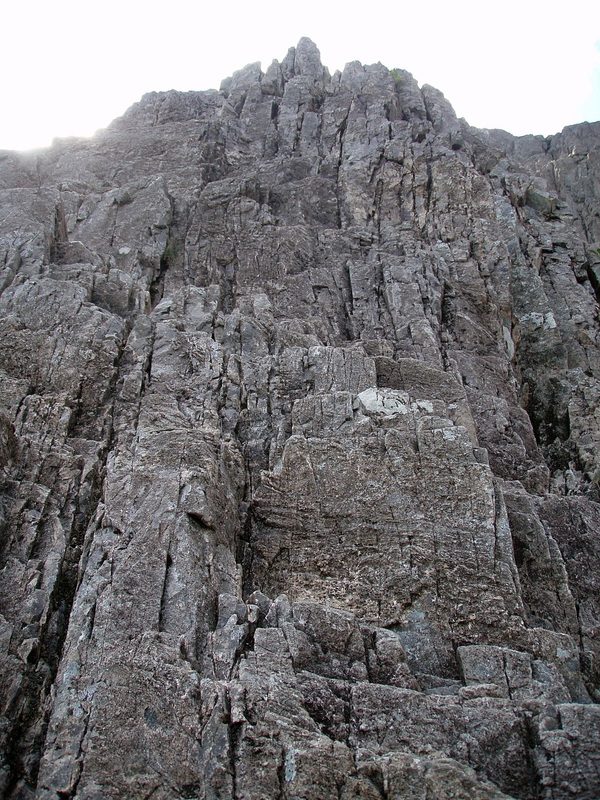 This chimney is supposed to be the crux of the route, but I find that it feels less exposed than the previous sections as there is a small platform below it. The rock is very smooth and I always struggle to make the first step up, but anyone with longer legs than me shouldn’t have a problem! 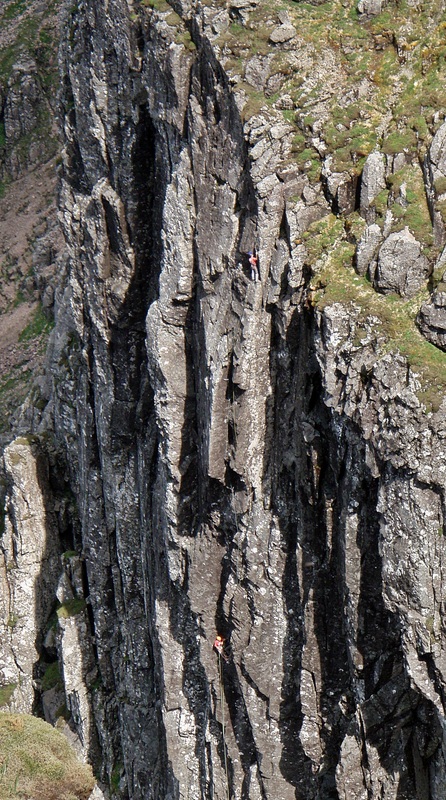 Once in the chimney, there are small ledges to stand on and good handholds as well. Looking down to the platform at the bottom of the chimney. 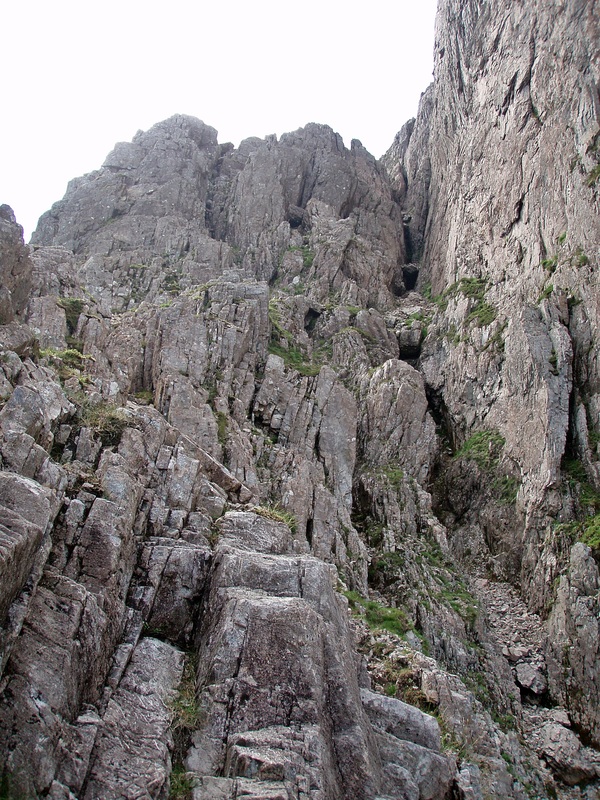 After the chimney the scrambling becomes easier. 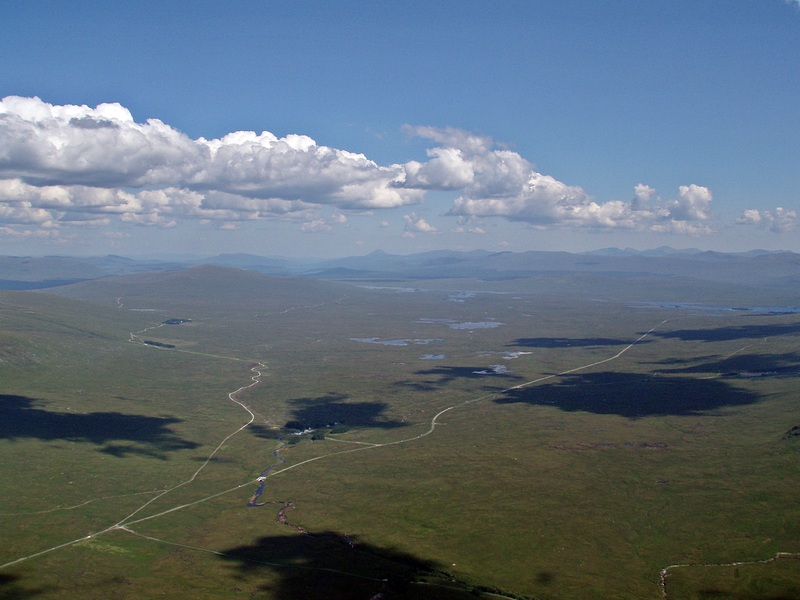 View across Rannoch Moor from the top of Curved Ridge. 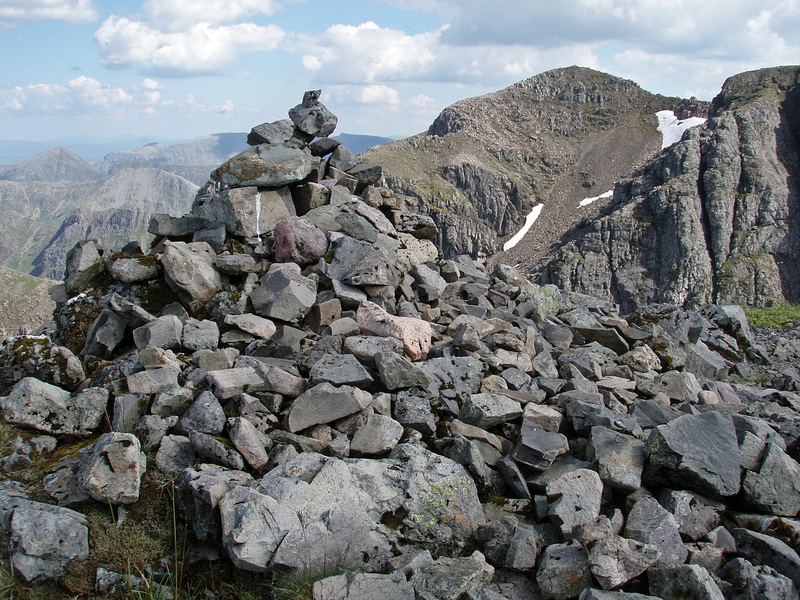 Crowberry Tower – it can be accessed by walking around it to the left and climbing into the gap between it and the summit of Stob Dearg. The ascent starts with this corner, first up some small ledges on the right and then a step across to a larger platform on the left. Once on the platform, a narrow path circles around the tower to the top. 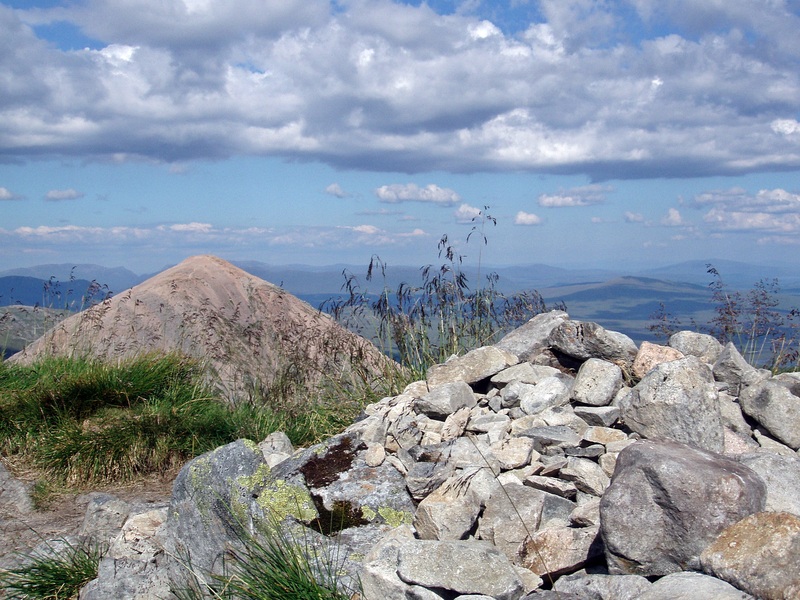 The top of Crowberry Tower is a fantastic and airy viewpoint – Ben Nevis and The Mamores. 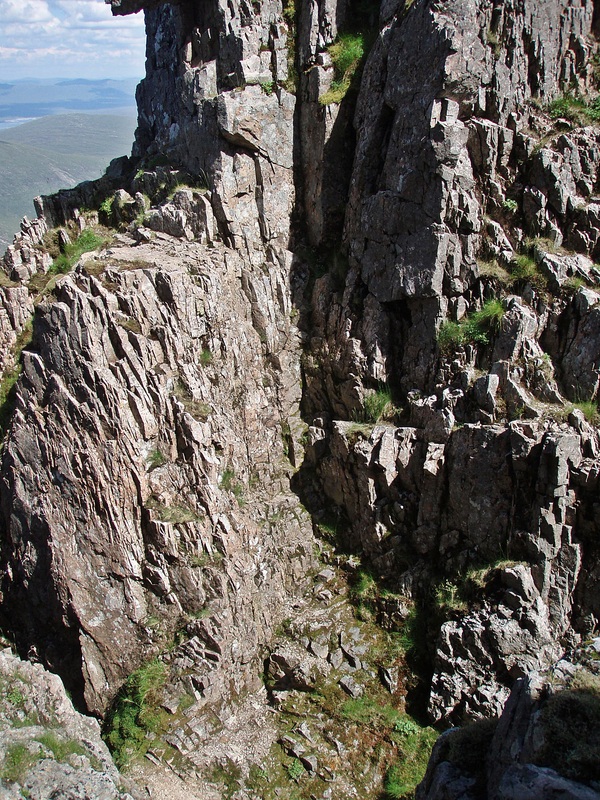 The downclimb from Crowberry Tower. 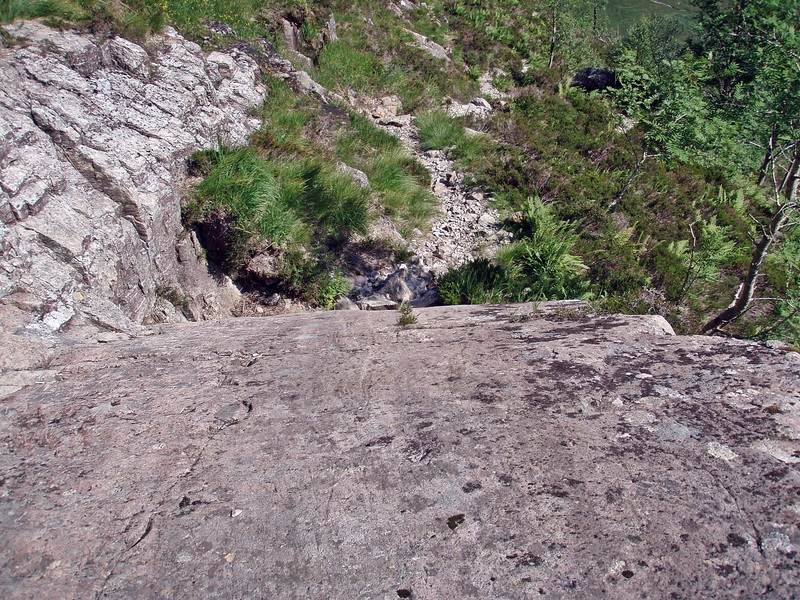 Platform on the left, ledge halfway down on the right. Looking down on the tower. 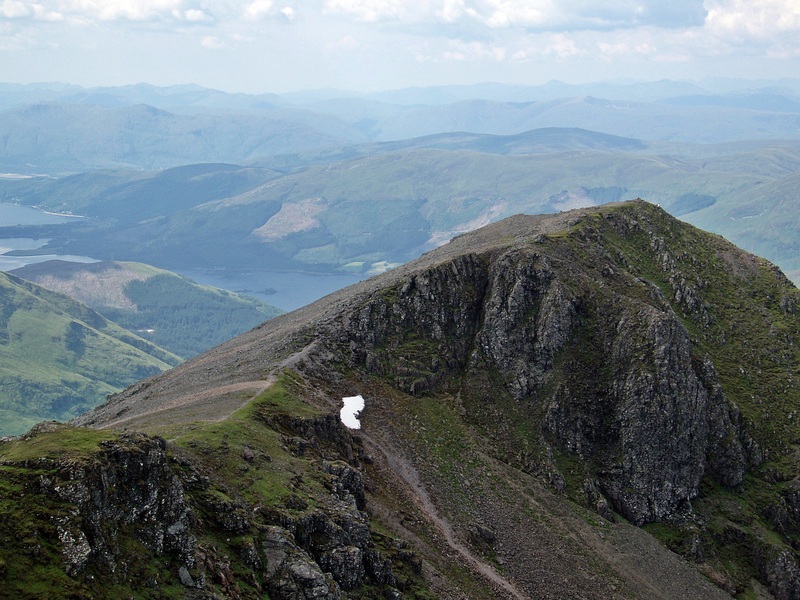 The last part of the ascent is on a steep scree path and some short and straightforward scrambling sections, and soon the summit of the first Munro Stob Dearg is reached. 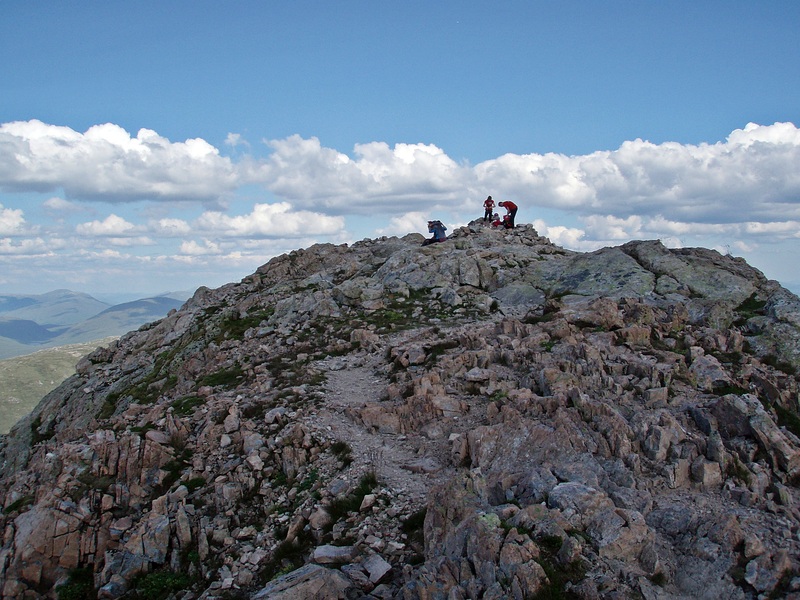 I would have liked to stop for a break but it was too midgey on the summit so I continued along the ridge, hoping to find a place with a little breeze to sit down for a while. 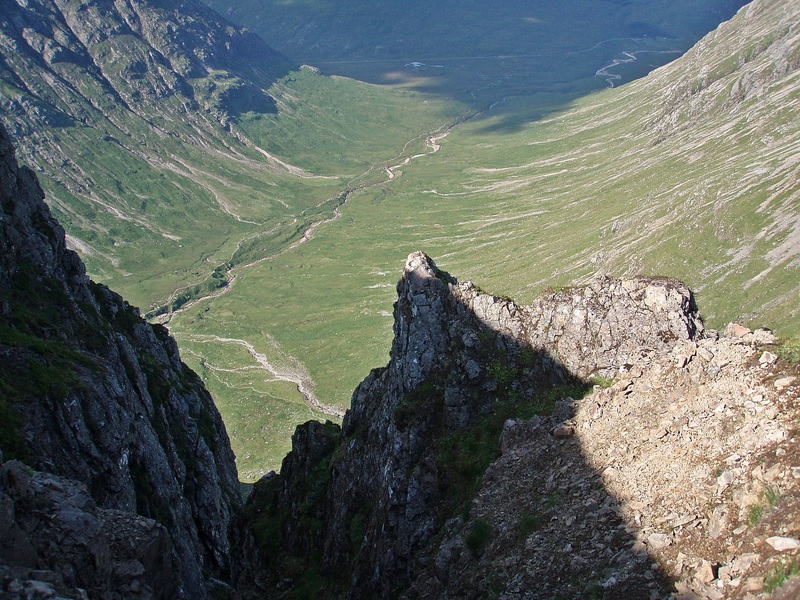 View down Coire na Tulaich, the “normal” ascent route. 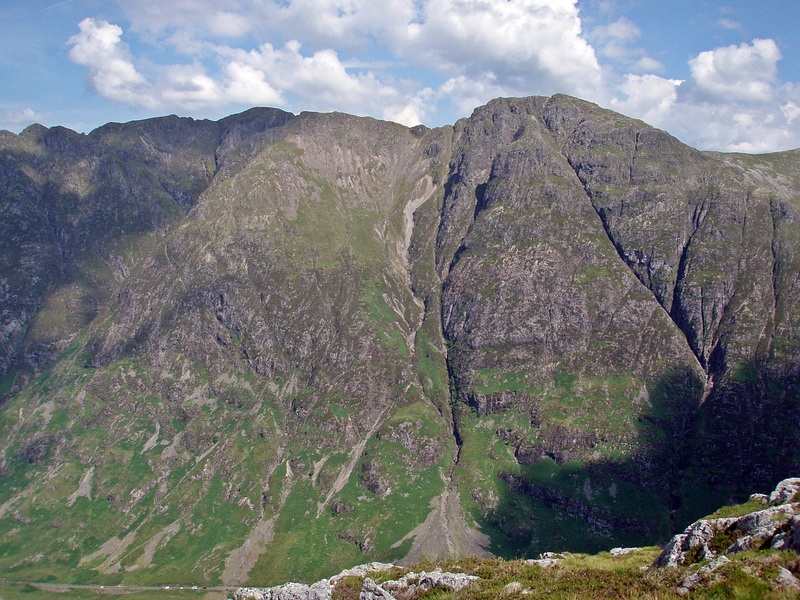 Stob Coire Raineach (Buachaille Etive Beag). 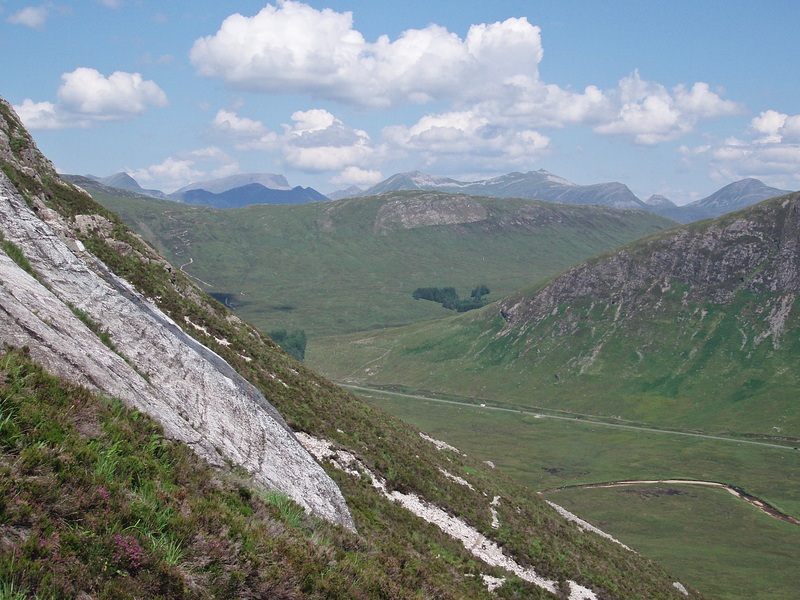 After a late lunch break near the 902 m point I followed the ridge towards Stob na Doire. 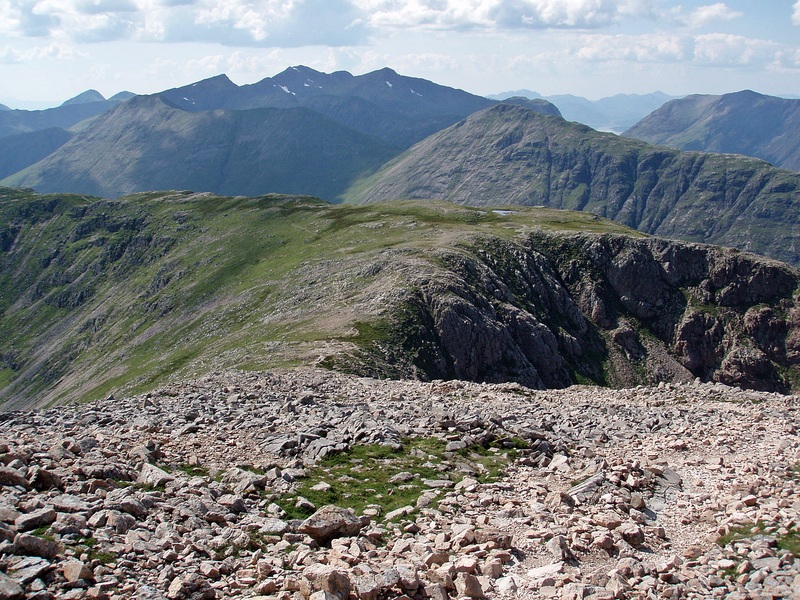 Looking back to Stob Dearg. 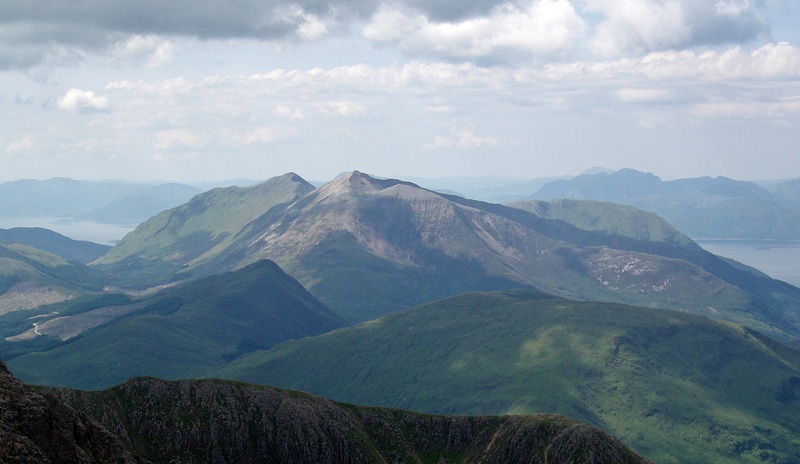 The Mamores and Ben Nevis. 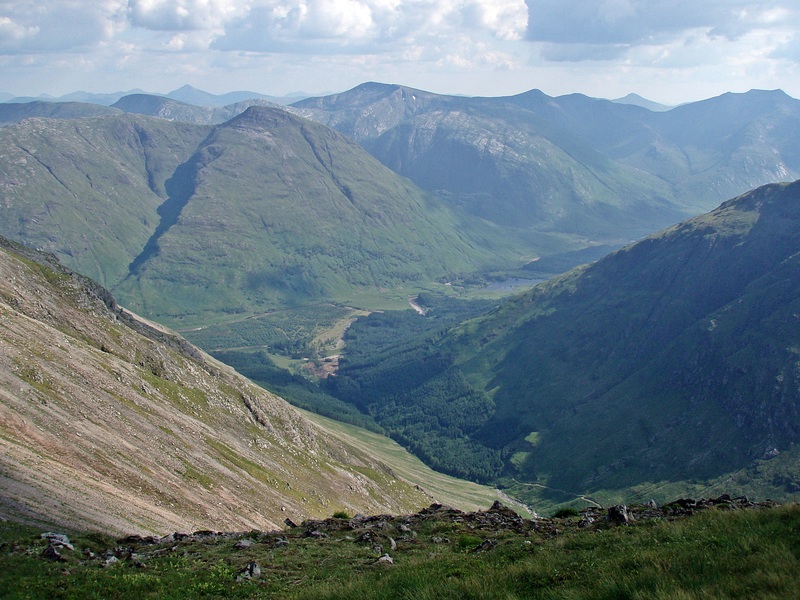 Glen Etive with Stob Dubh, and the Ben Starav group in the background. 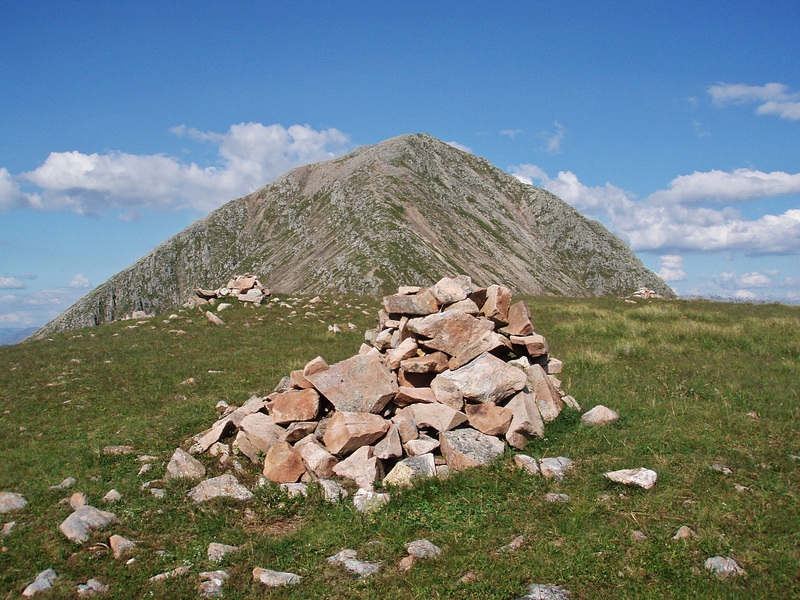 The summit of Stob na Doire, the first Munro Top. 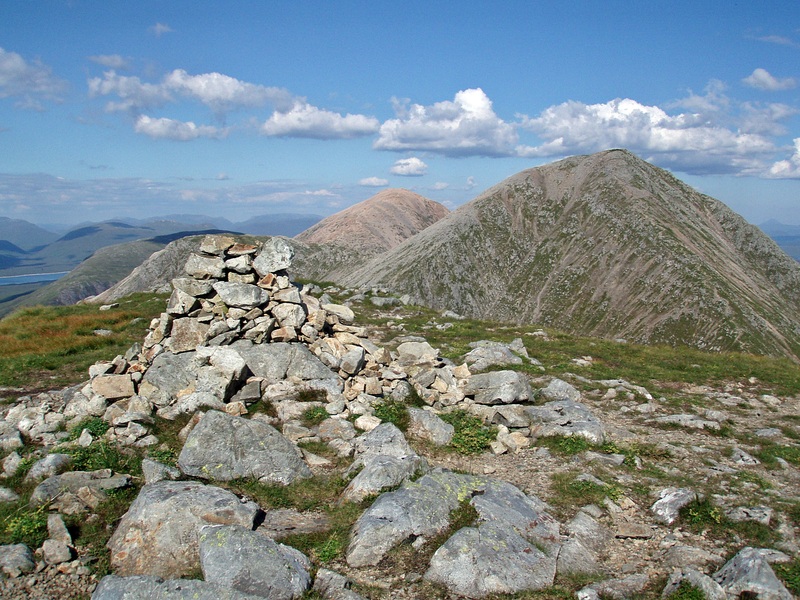 An unnamed top between the two Munro Tops is decorated with various cairns. 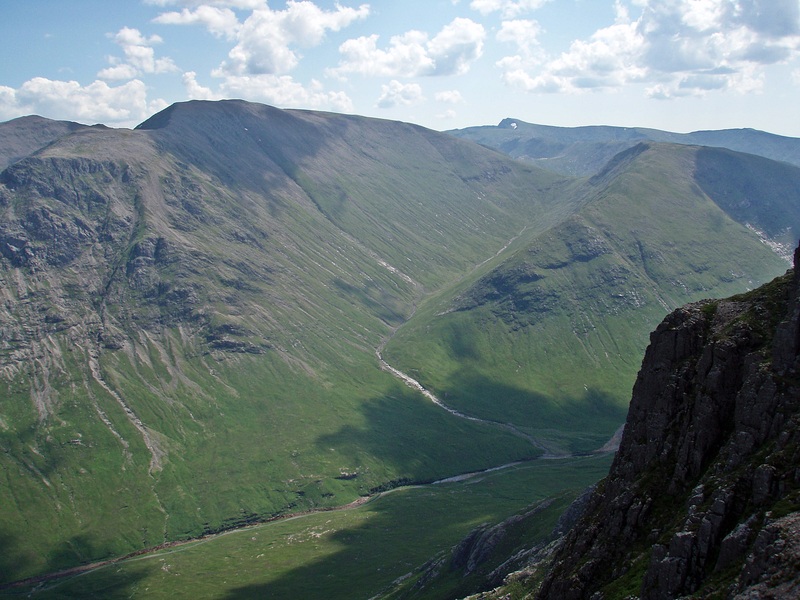 Coire Altruim and Lairig Gartain. 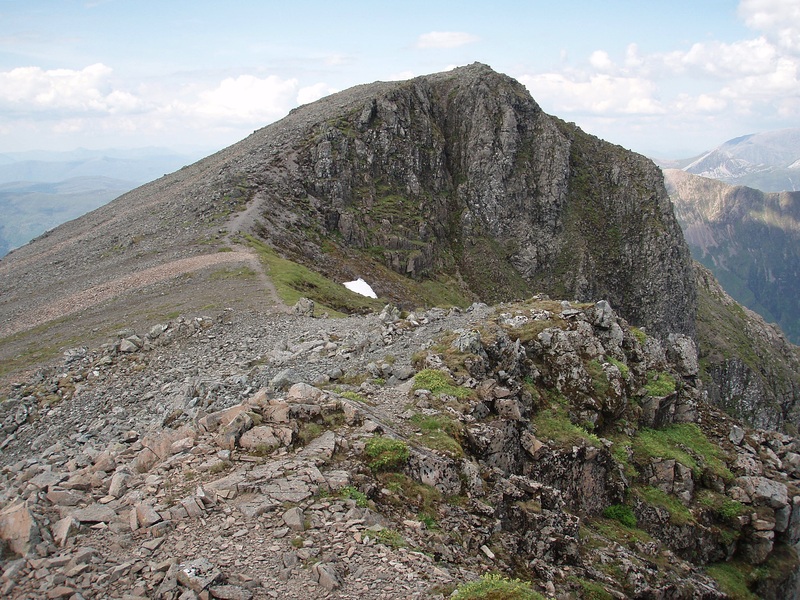 The second Munro Top Stob Coire Altruim. 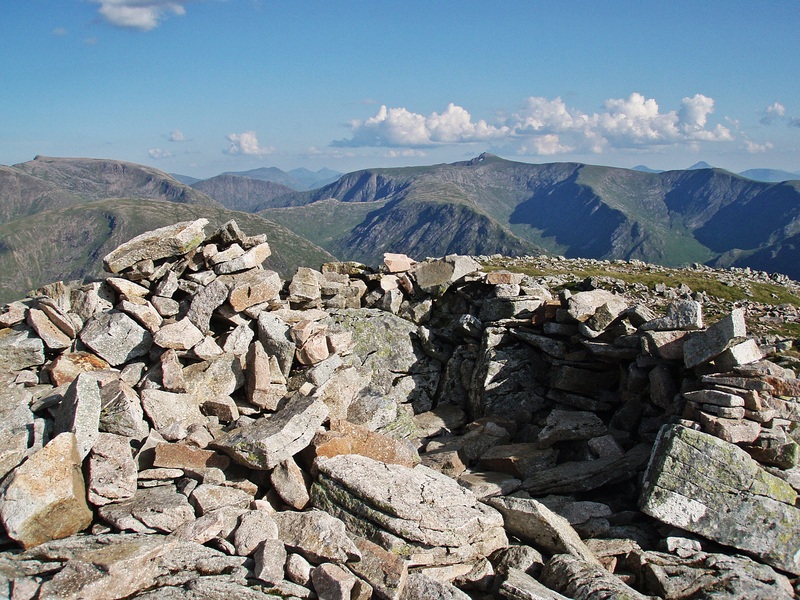 Stob na Bròige summit shelter. 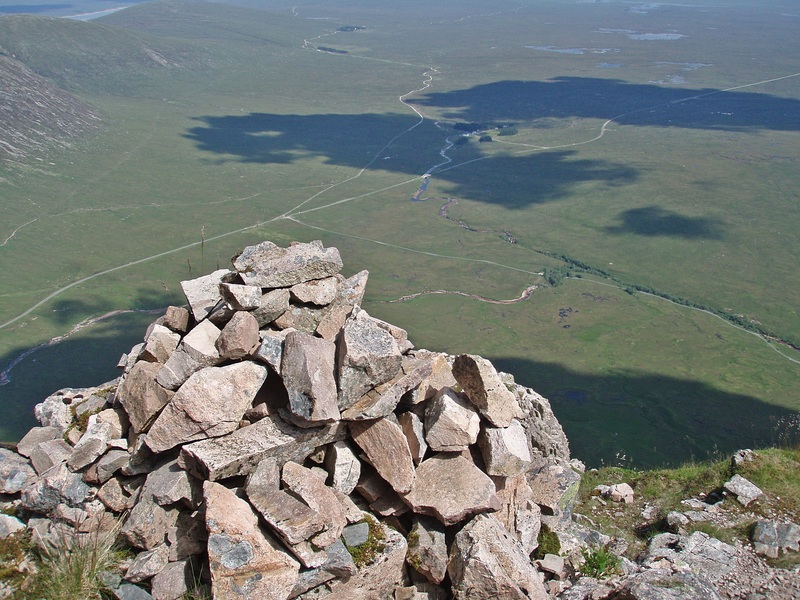 I continued past the summit to get a better view to Loch Etive and again, to find a midge-free spot to sit down for another break. 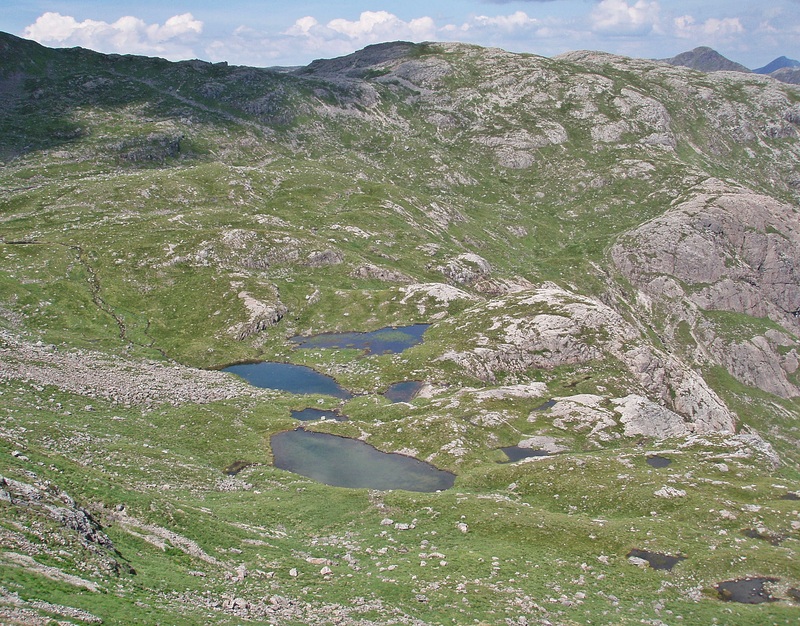 But it didn’t take long for the midges to find me and so I cut my break short and walked back to the top of Coire Altruim and the start of the descent path. 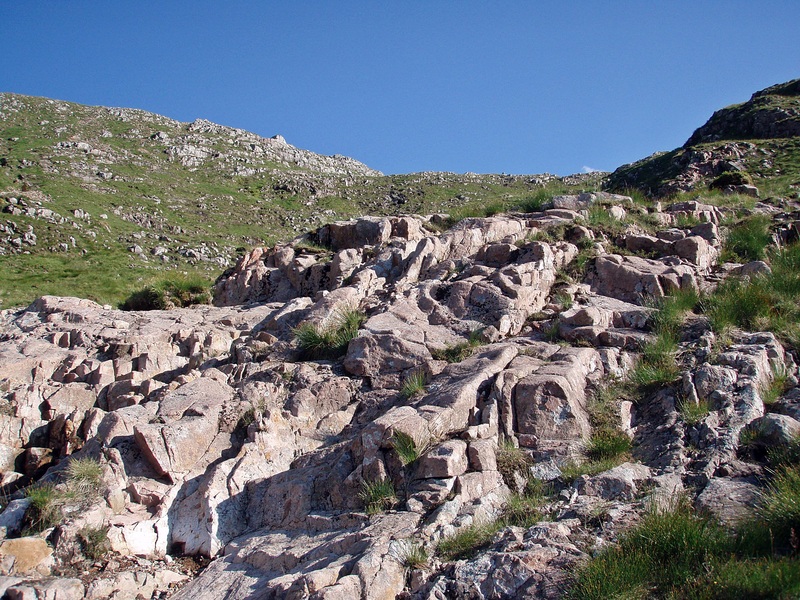 Although there is a good path leading down to the Lairig Gartain, there are some rocky sections that require care, especially with tired legs after a long day. 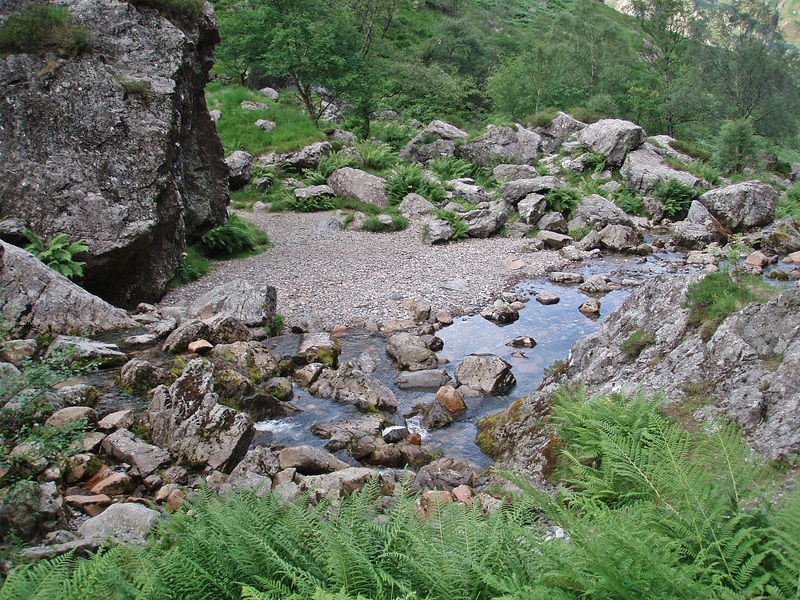 Stepping stones at the ford across the River Coupall. 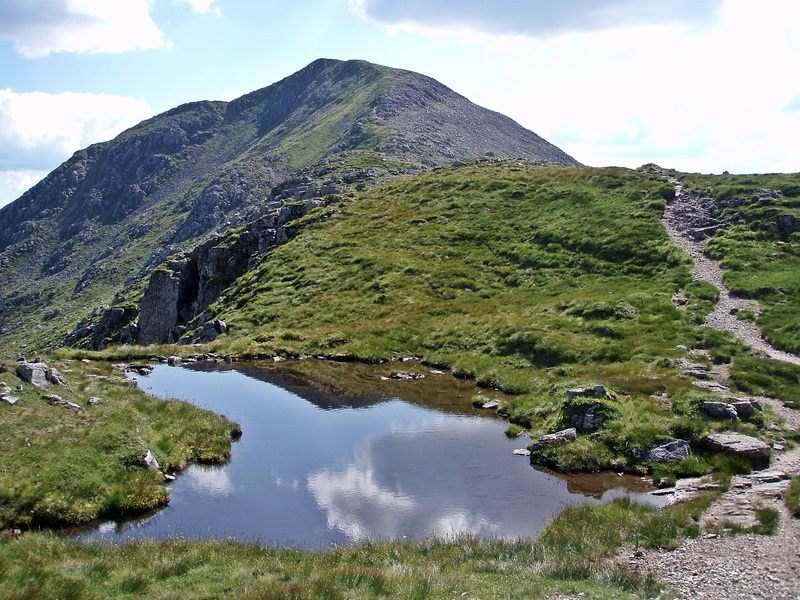 After the path along the Lairig Gartain has been improved a few years ago, it is now a very enjoyable walk back to the car – before that it used to be a boggy mess. I had planned to camp behind the Kings House Hotel (and have a bar meal as well), but when I got there the camping area was very busy, with some of the campers gathering around their tents, beer cans in hand and the whole atmosphere didn’t feel very inviting. 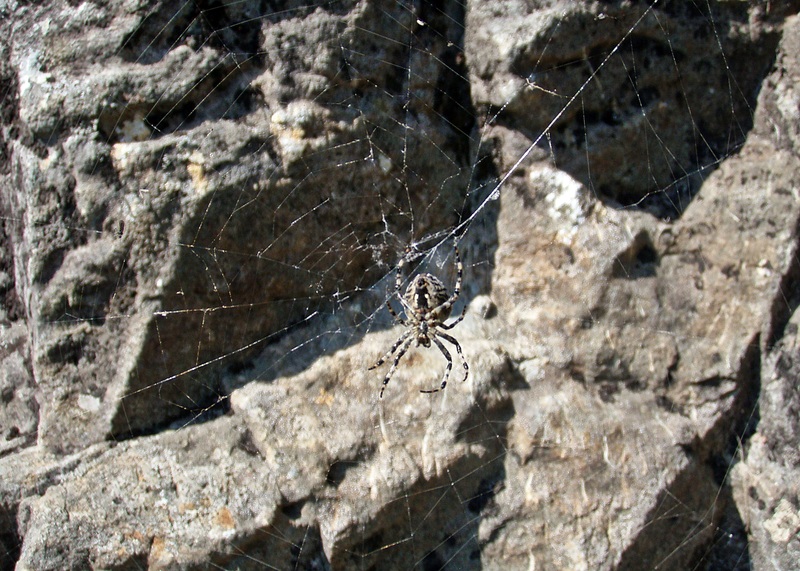 Besides, the midges were already swarming around outside my windows and just waiting for me to get out of the car! 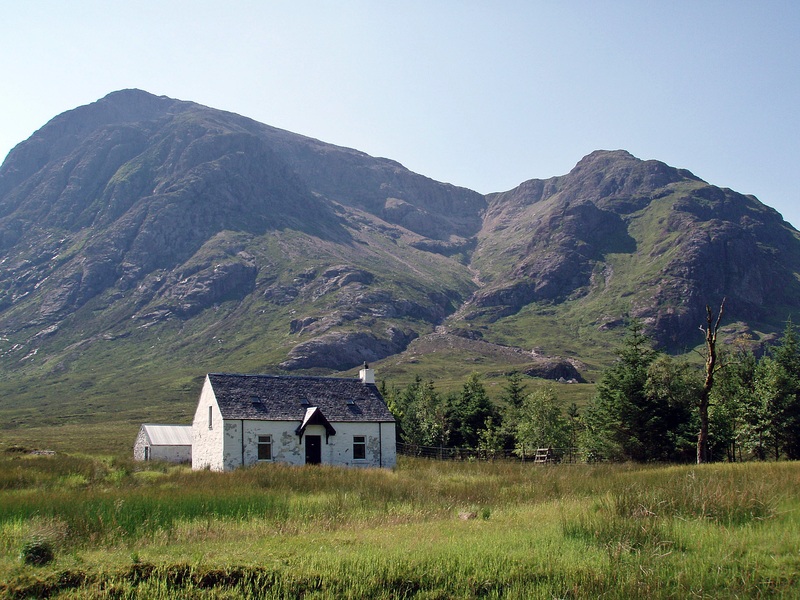 Of course the midges were just as bad as by the hotel, but at least it was quiet and I got a good night’s sleep. 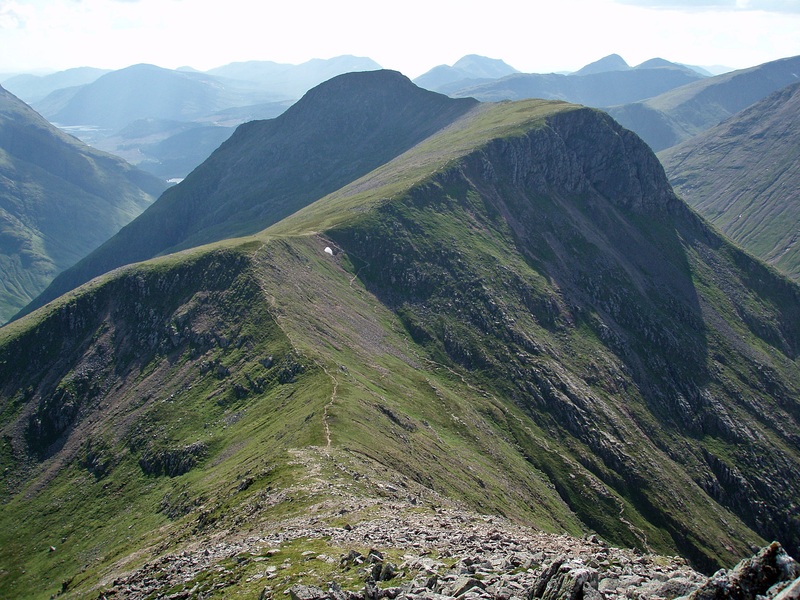 For today I had an ambitious plan – the two Munros Bidean nam Bian and Stob Coire Sgreamhach and their four Tops in an anti-clockwise round. 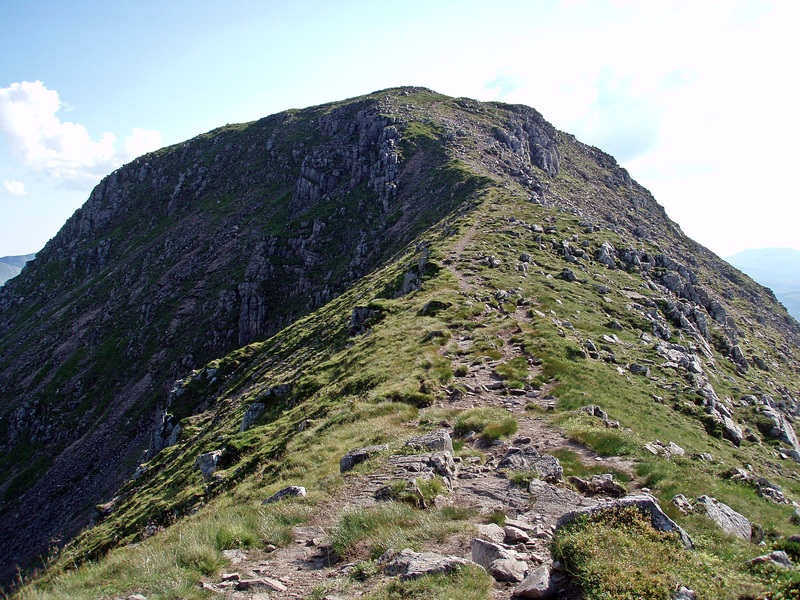 My plan was to use The Zig Zags on Geàrr Aonach for the ascent and to return along the Beinn Fhada ridge. 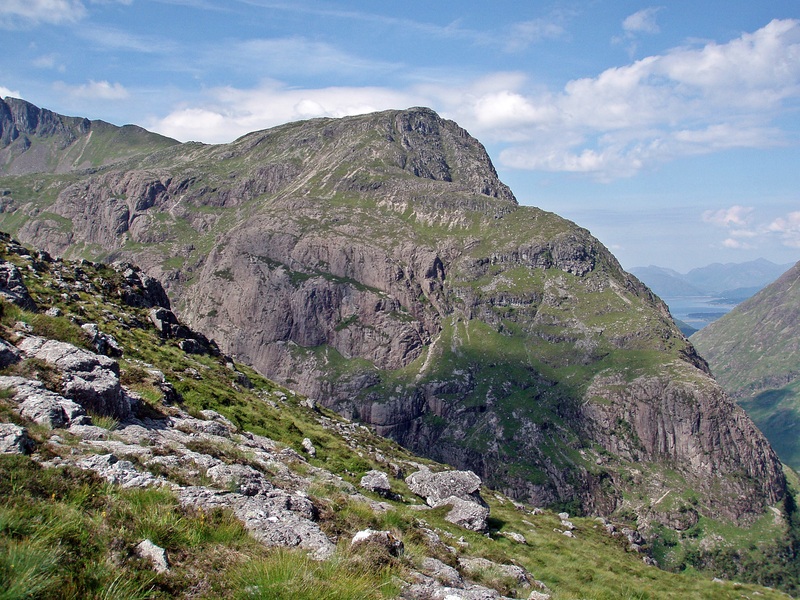 The Zig Zags are a Grade 1 scrambling route that I had enjoyed very much when I did it the first time a few years ago, not so much for the scrambling itself as it is really just a couple of short sections, but especially for its airy position high above Glen Coe and the views from there. 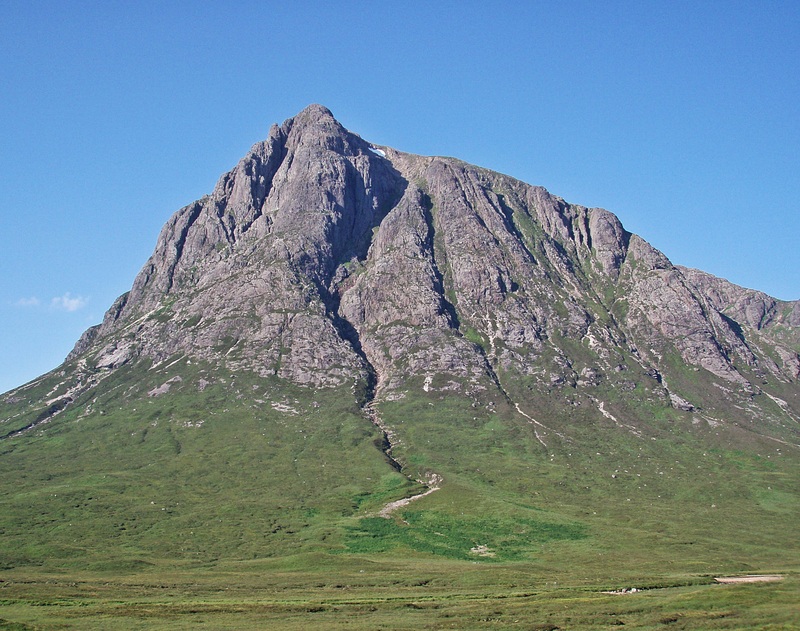 On my way to the car park opposite The Three Sisters I stopped in a lay-by for a photo of Stob Dearg and yesterday’s route. 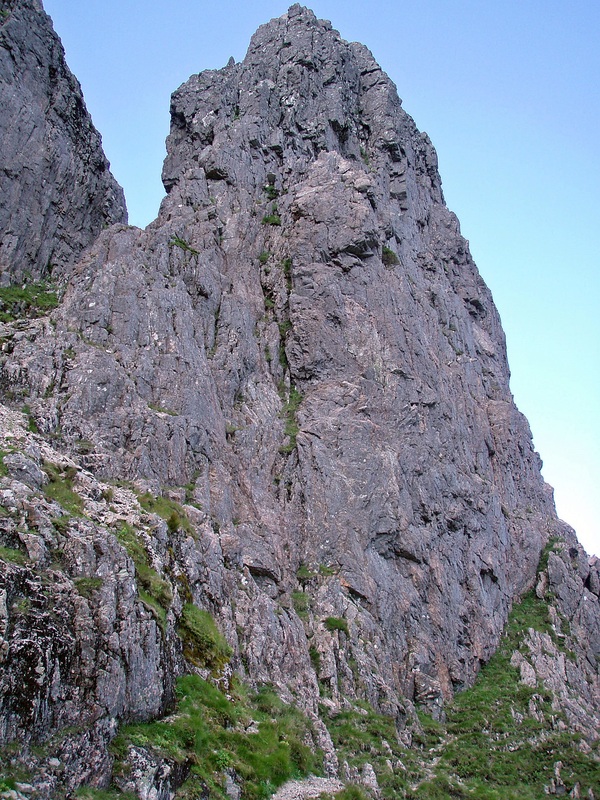 North Buttress in the centre, Crowberry Ridge with Rannoch Wall to its left and Curved Ridge directly to the left of Crowberry Ridge. The car park on the A82 was already full at 09:30, and after waiting in vain for someone to leave I just parked by the side of the car park, making sure not to block the way in or out. 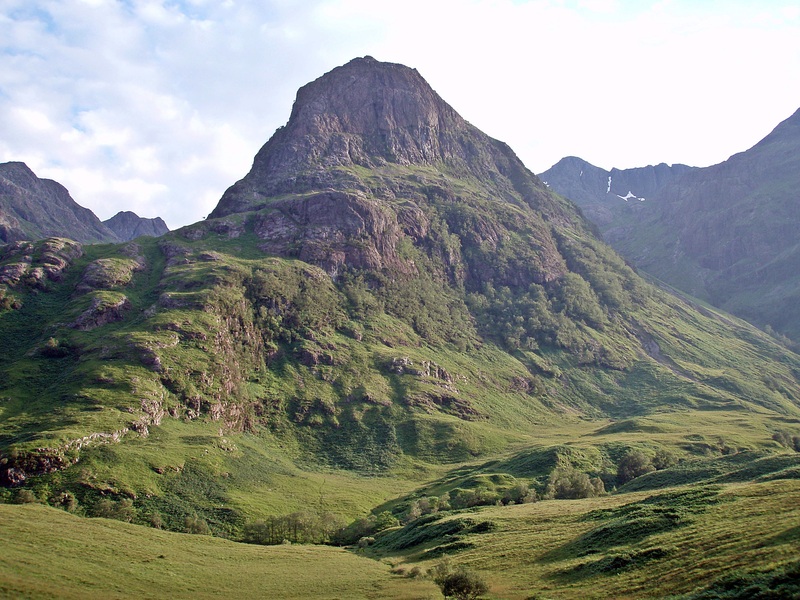 Two of The Three Sisters, Geàrr Aonach and Aonach Dubh. 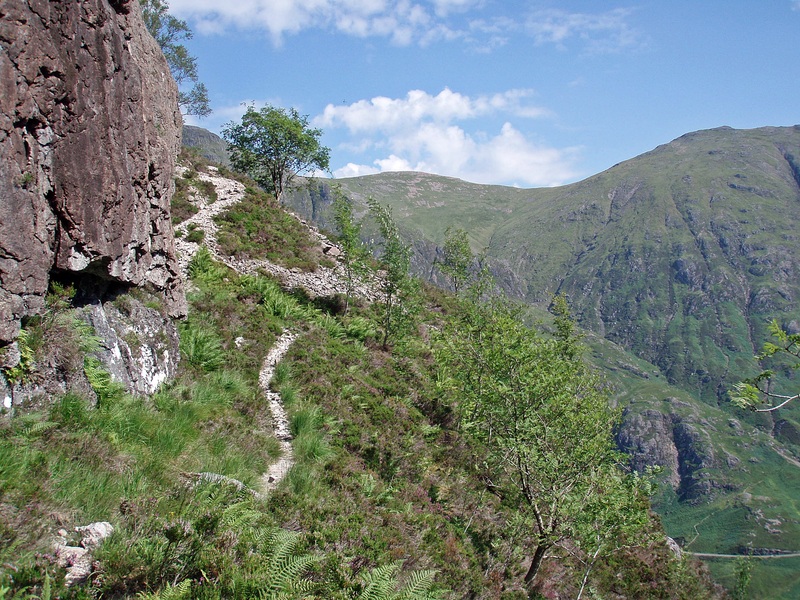 When I followed the path to the River Coe and the footbridge across it, I noticed that a steel cable had been installed as a handrail for the first few metres of the rocky ascent on the other side. 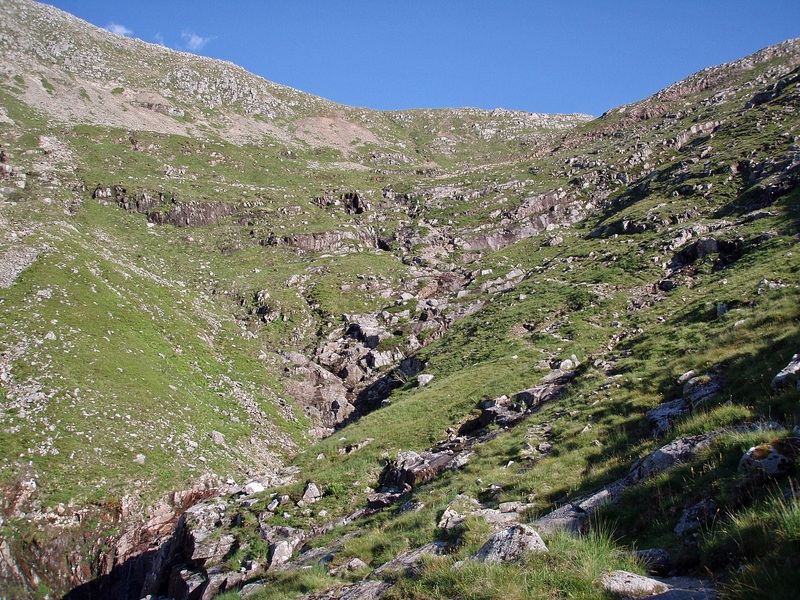 After that a well-constructed path leads into Coire Gabhail, the “Lost Valley”. 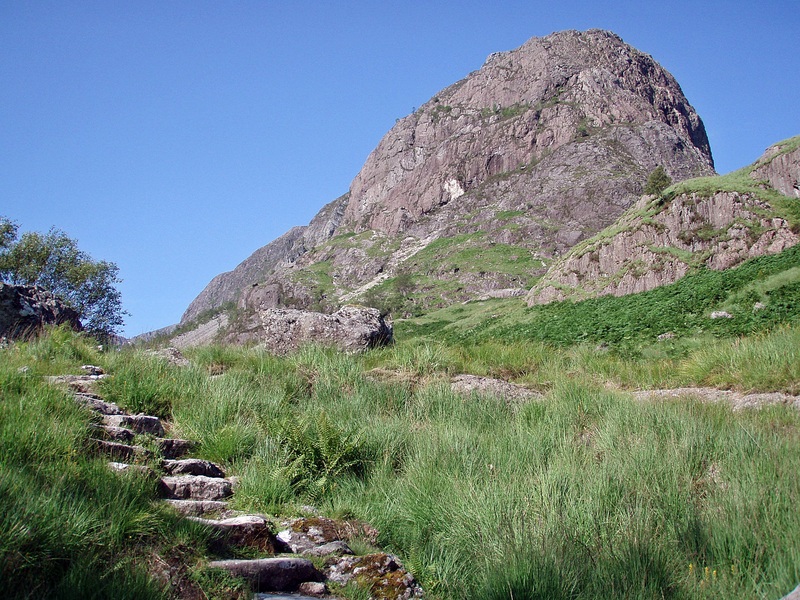 A large boulder with an arrow on it marks the start of a smaller path leading off to the right (in ascent). 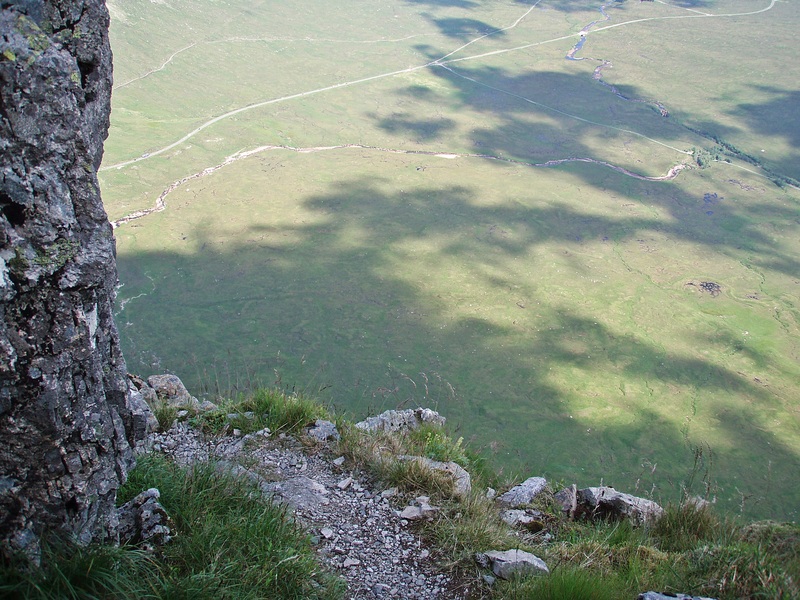 This path runs parallel to the main path into Coire Gabhail and joins it again higher up. 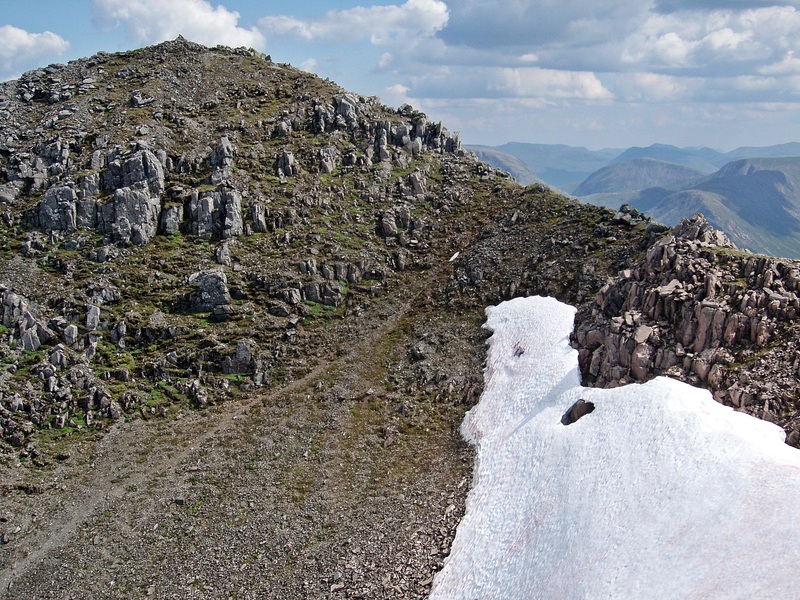 Soon I left this path to climb towards the lighter-coloured patch on the E face of Geàrr Aonach. 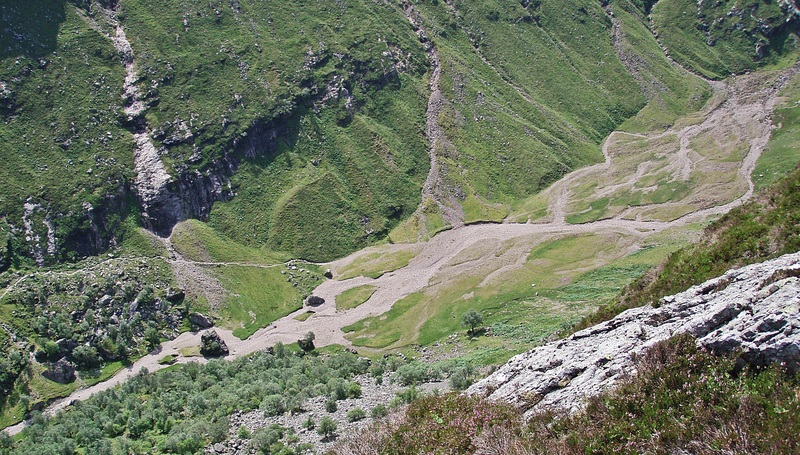 Looking down from the steep slope to the path, just visible on the right. 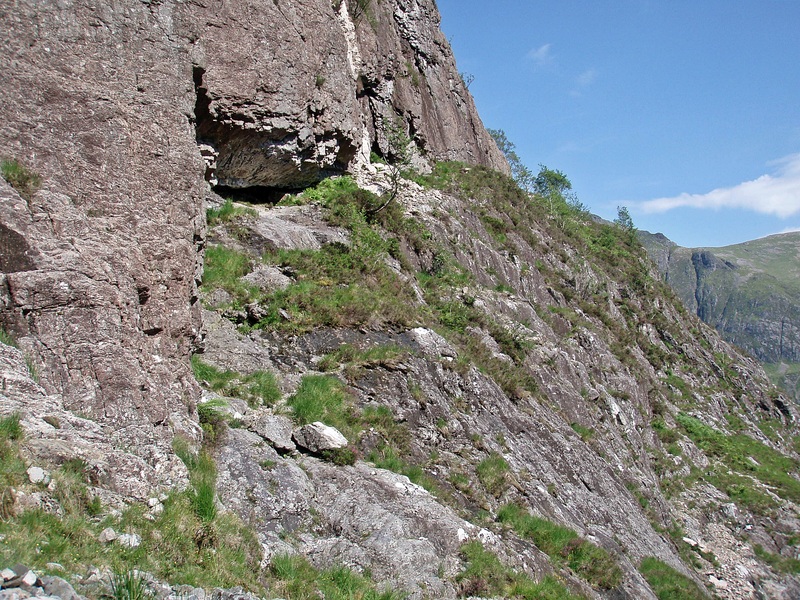 The overhanging rock to the left of the white patch is the start of The Zig Zags. 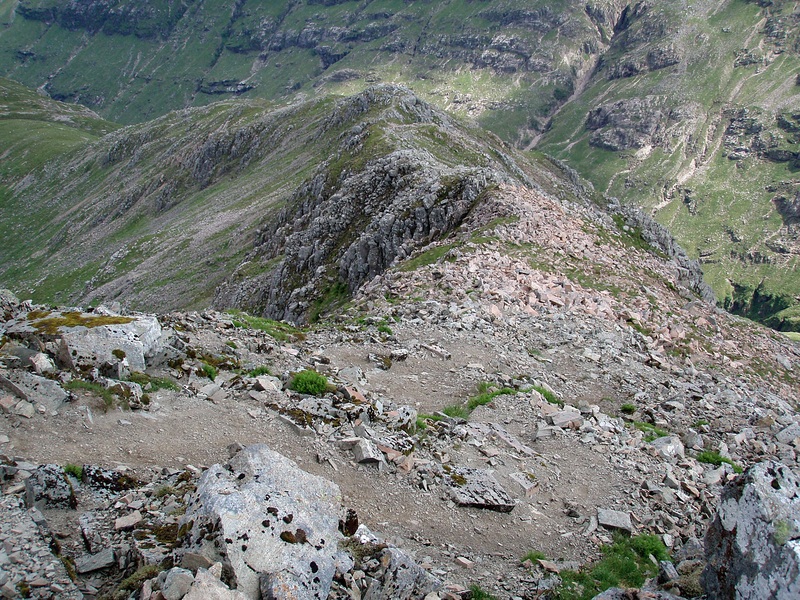 From here a small path leads around to the “nose” of Geàrr Aonach. 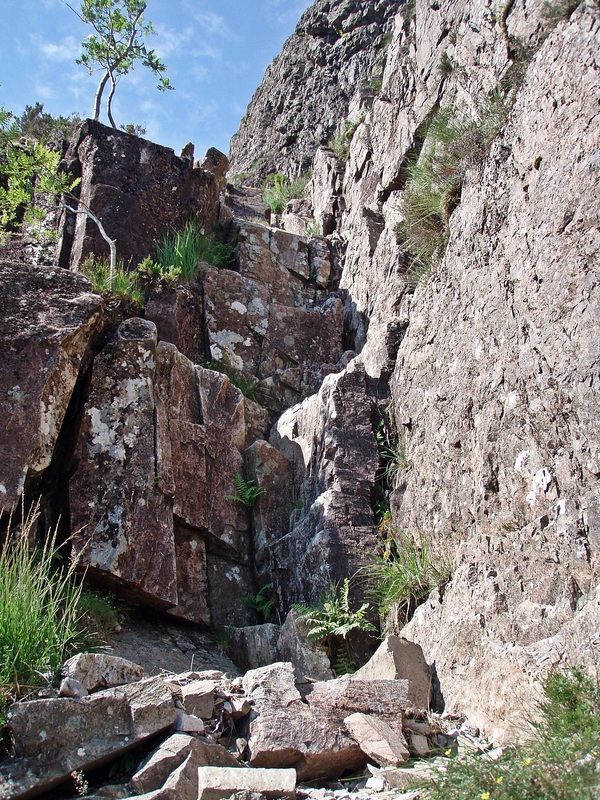 One of the few scrambling sections is this staircase of large rock steps. 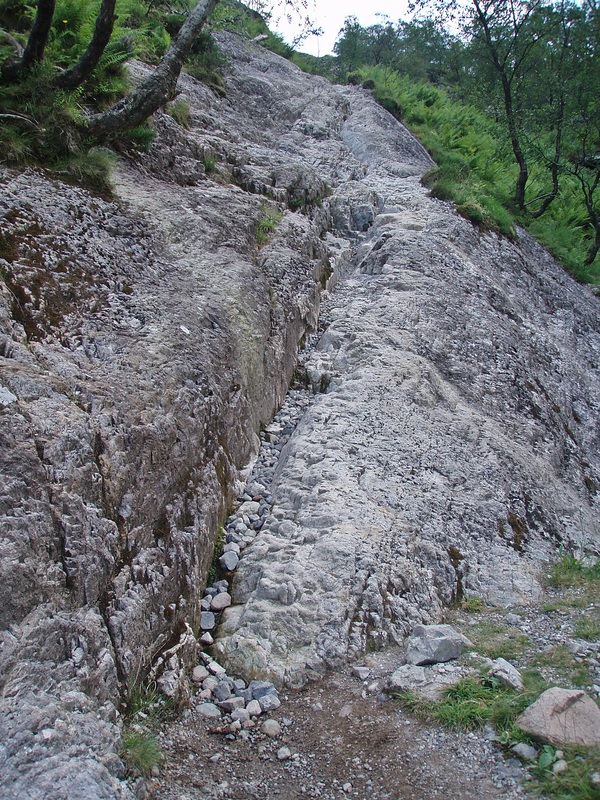 Shortly after, a smooth rock slab needs to be ascended, but in dry conditions it is very grippy and can also be bypassed via the rocks to the side of it. 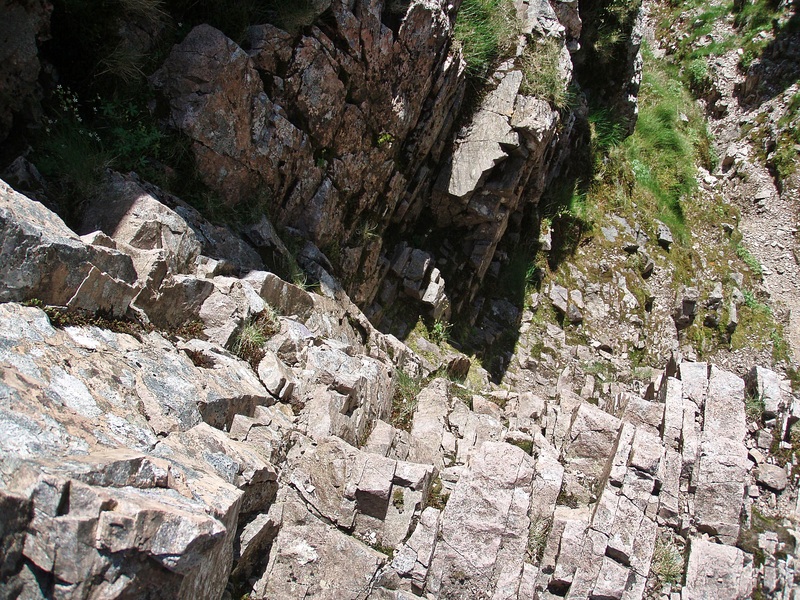 Looking down the slab, with the rocks to its left. 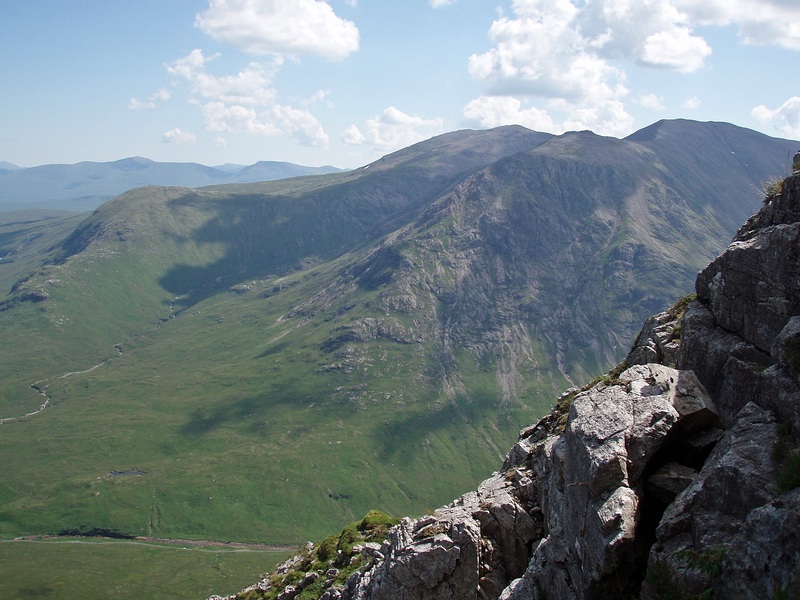 After zig-zagging back and forth the scrambling route ends at the N end of Geàrr Aonach, overlooking Glen Coe. 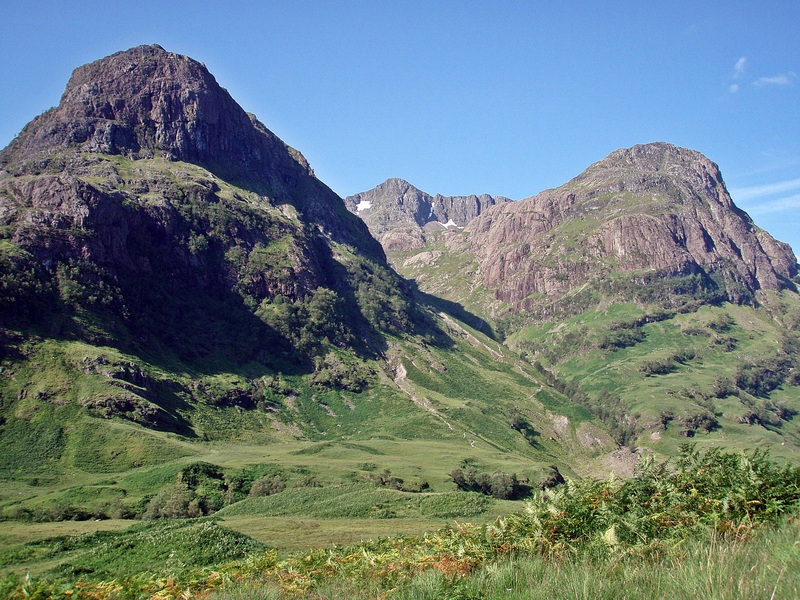 Glen Coe, with Beinn a’ Chrùlaiste in the distance. 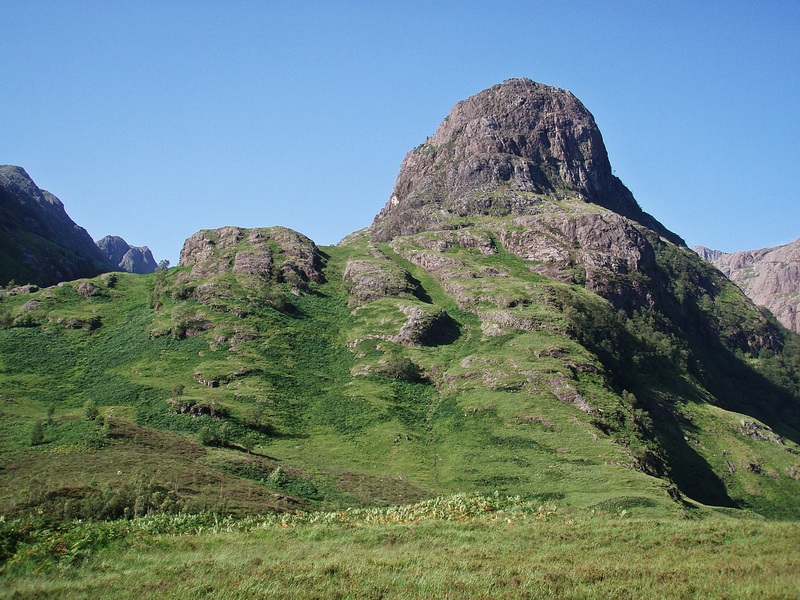 Sgorr nam Fiannaidh and Stob Coire Lèith. 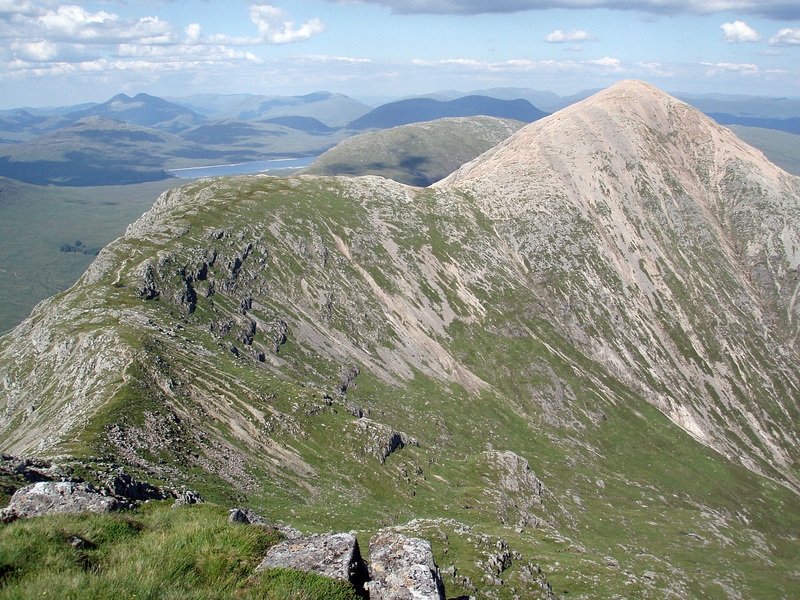 Meall Dearg and Am Bodach. 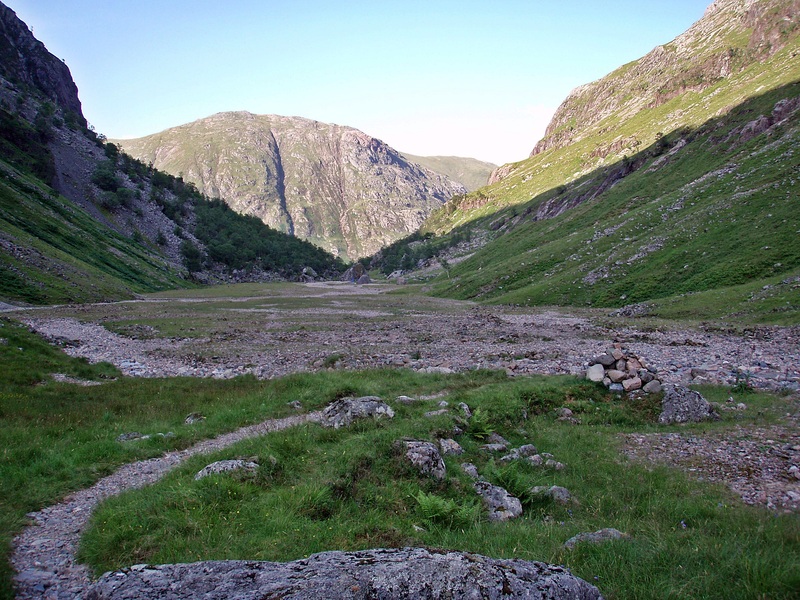 Coire Gabhail – The Lost Valley. 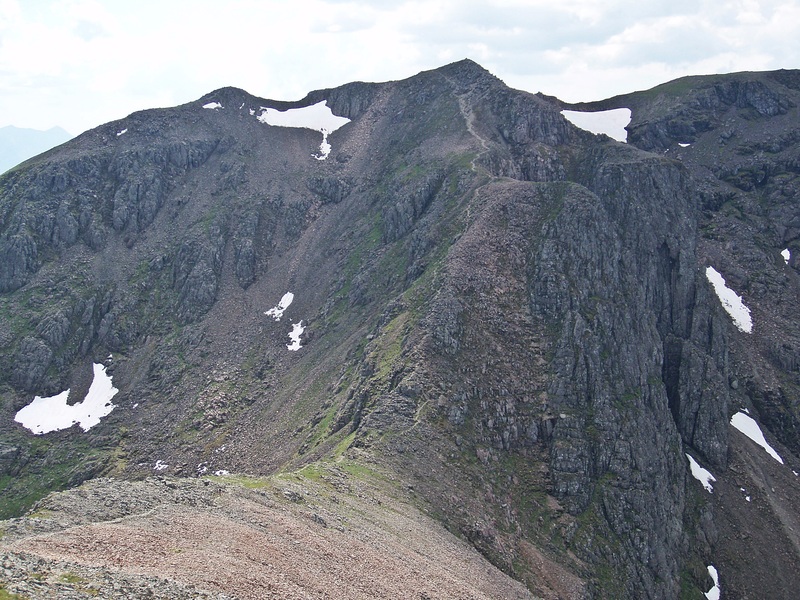 After a lunch break I continued along the ridge of Geàrr Aonach towards Stob Coire nan Lochan. 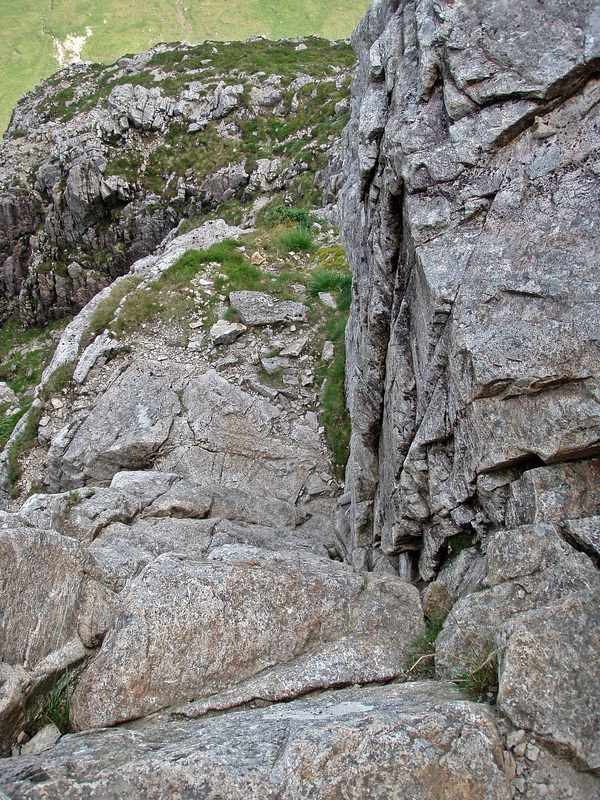 Crags below Stob Coire nan Lochan. 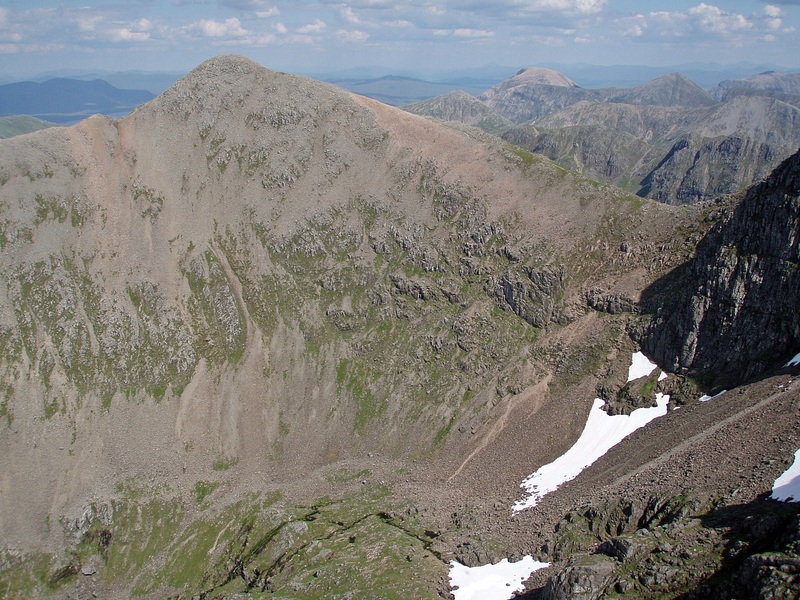 Stob Coire Sgreamhach and Bealach Dearg. 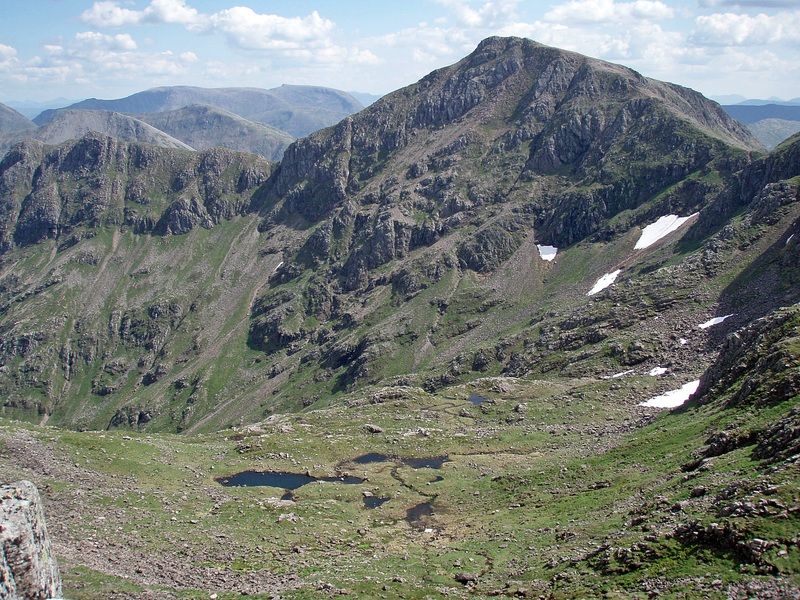 View back to Coire nan Lochan and Geàrr Aonach. 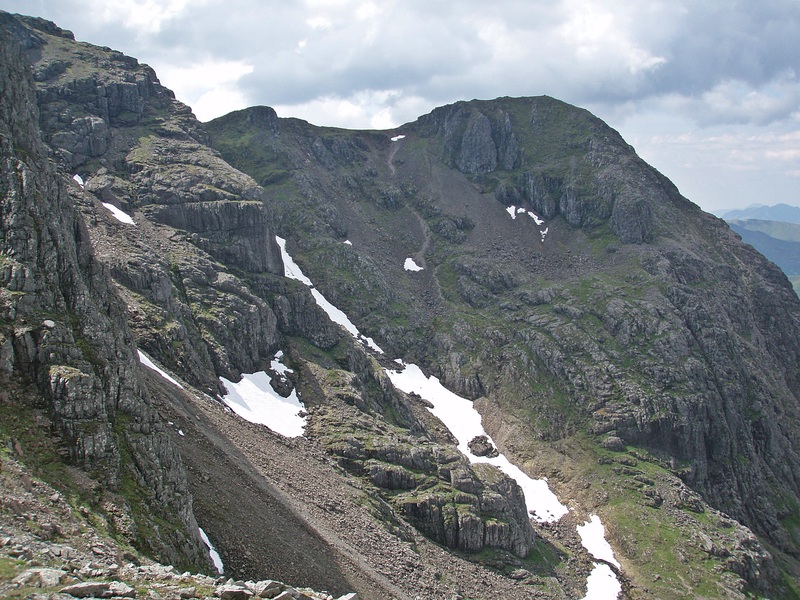 Towards the summit of Stob Coire nan Lochan the ridge becomes rockier, giving some opportunities for straightforward scrambling. 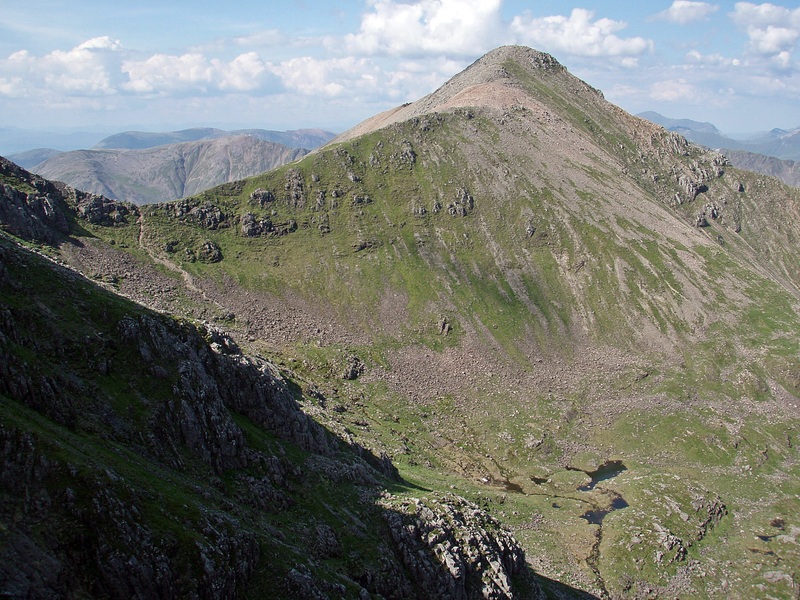 Stob Coire nan Lochan E ridge. 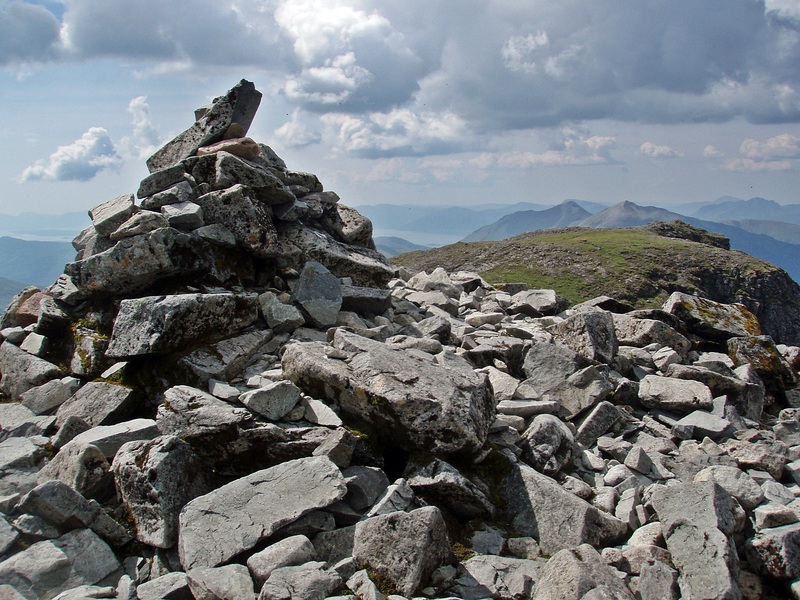 The summit of Stob Coire nan Lochan, the first Munro Top. 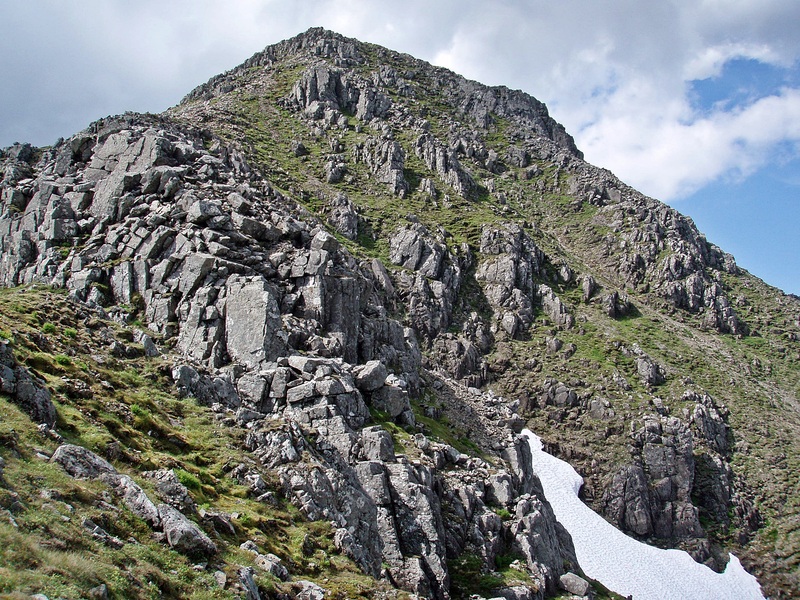 Stob Coire nan Lochan’s N ridge, I have never used this as an ascent route but it seems to be an easy-angled wide ridge that doesn’t involve any scrambling. 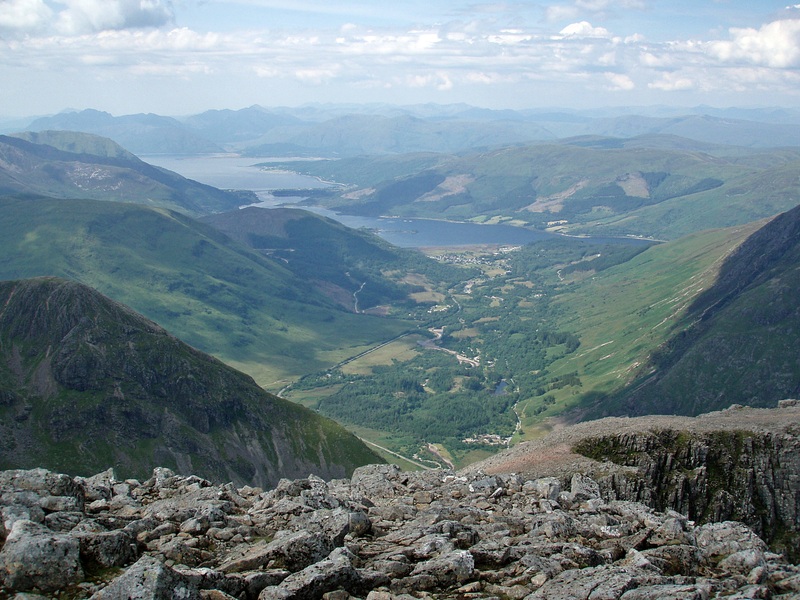 Loch Linnhe, Loch Leven and Glencoe Village. 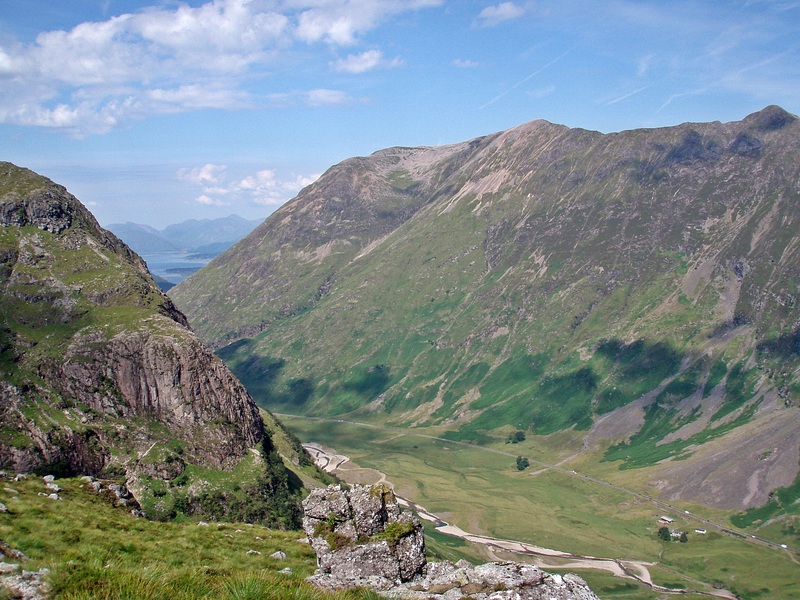 Aonach Eagach, the Mamores and Ben Nevis in the far distance. 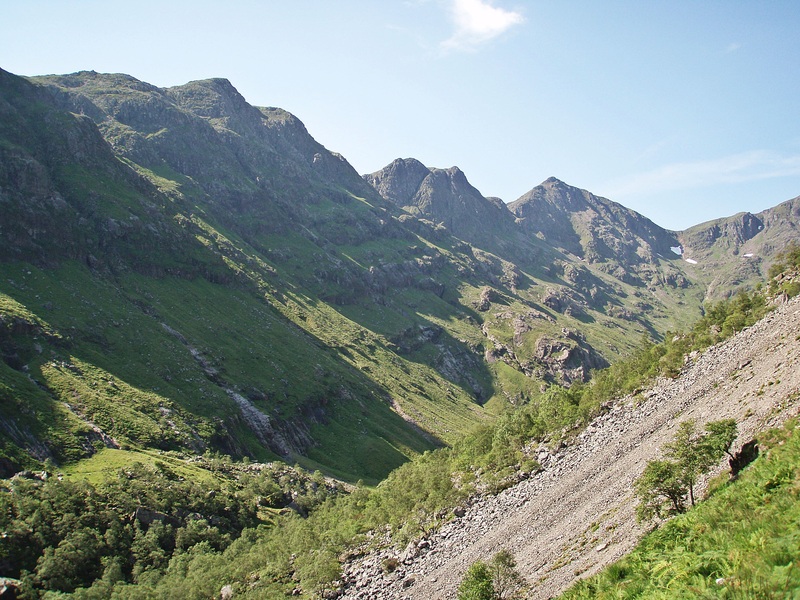 The way ahead to Bidean nam Bian. 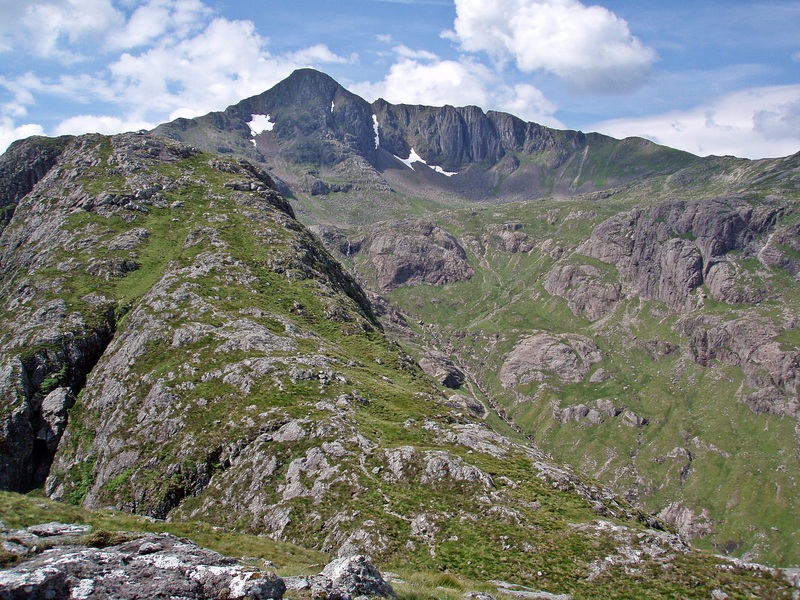 Looking across to Stob Coire nam Beith, the second Munro Top. 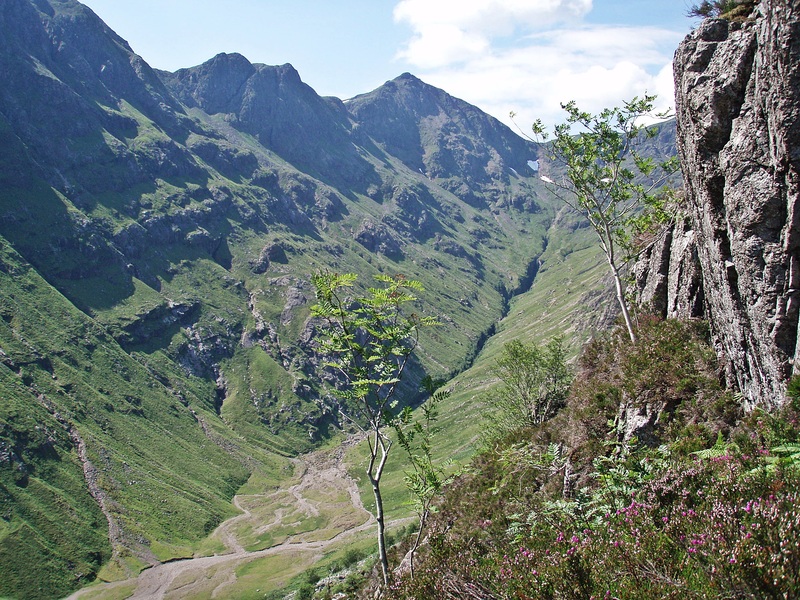 The ascent to Bidean nam Bian. 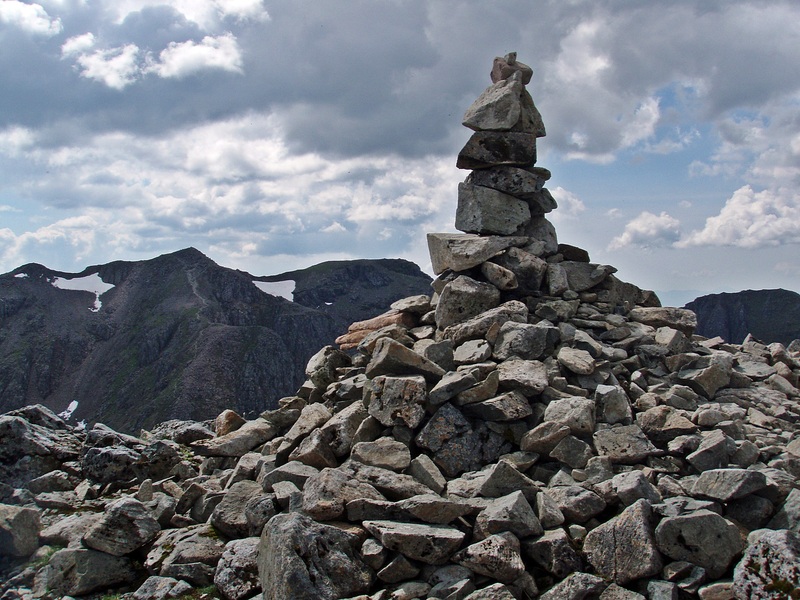 The summit of Bidean nam Bian. 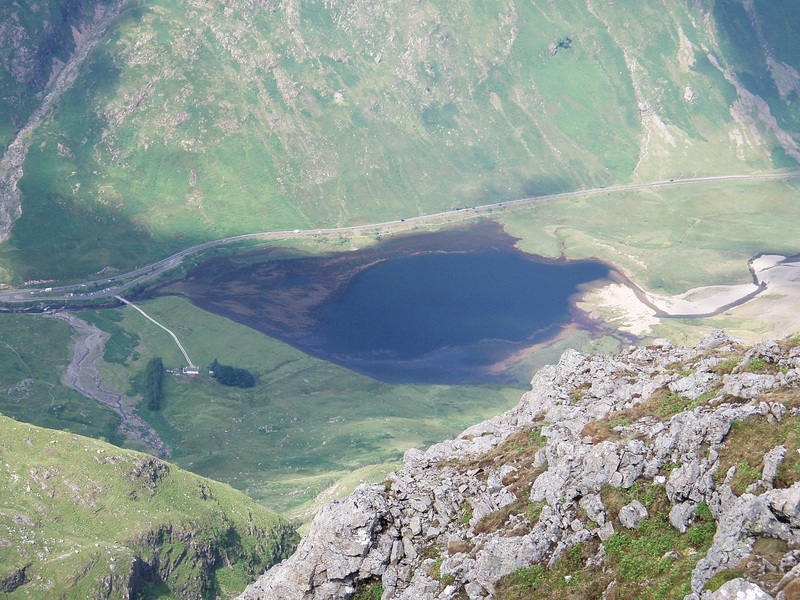 From the summit I followed the edge of the coire first E, then N to reach the second Munro Top. 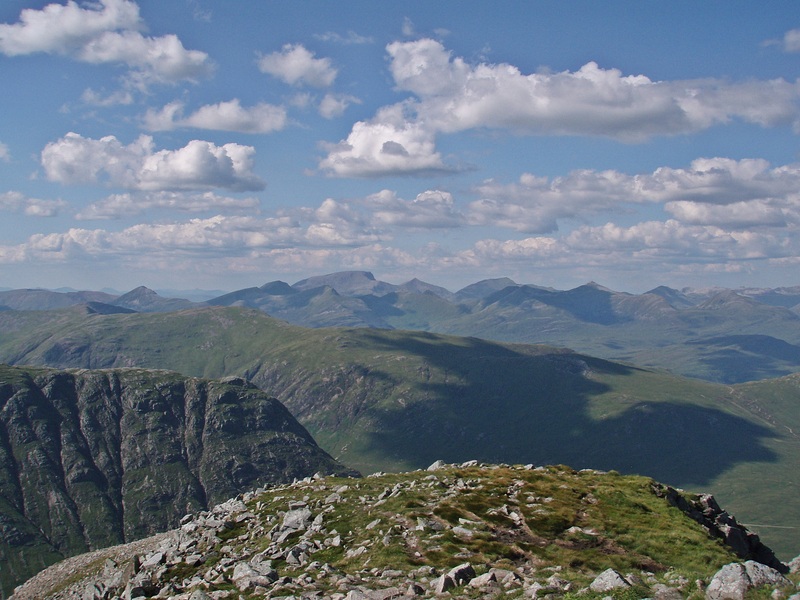 Looking back to the Munro summit. 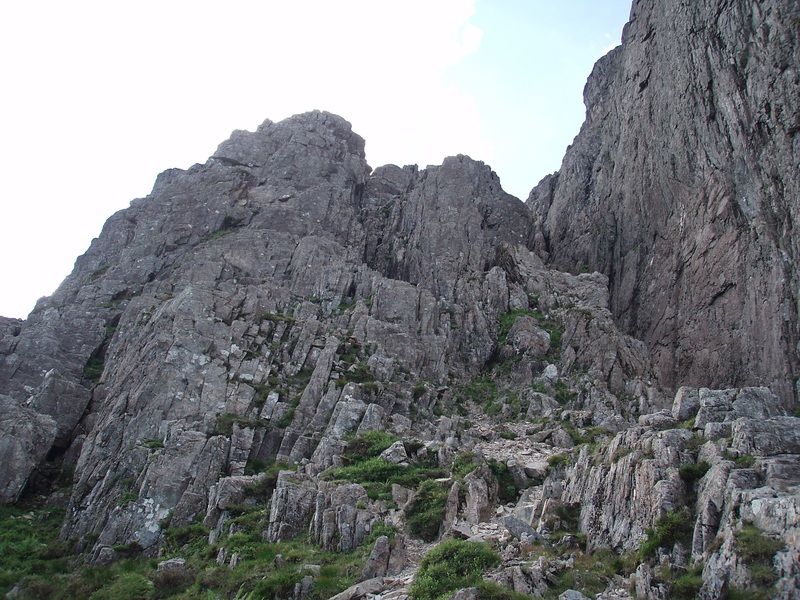 On my way I spotted a couple of rock climbers on the crags N of the summit. 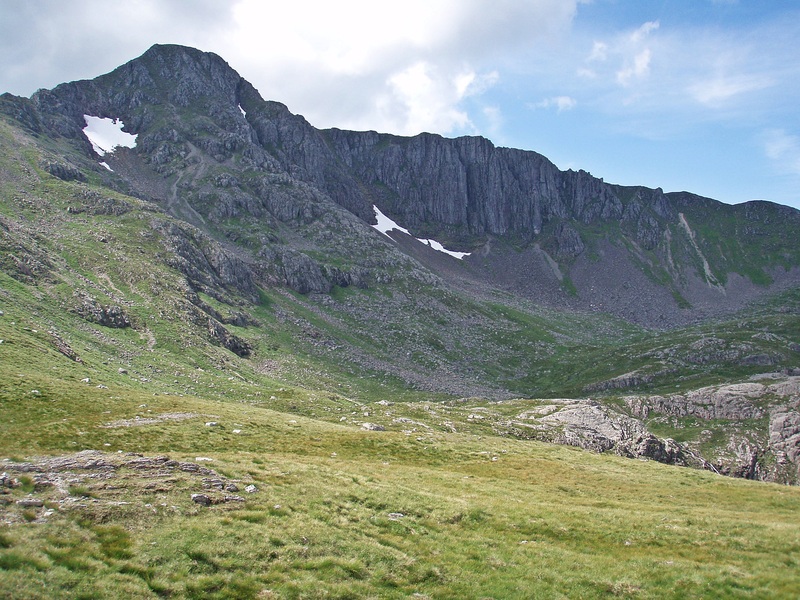 Approaching Stob Coire nam Beith. 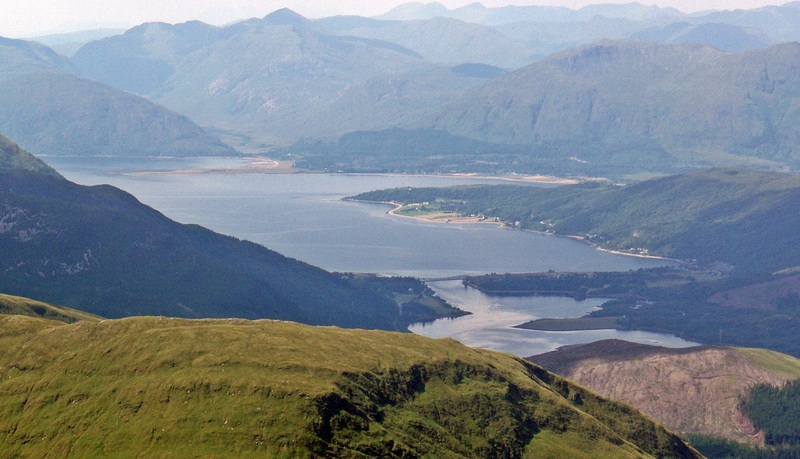 Ballachulish Bridge and Loch Linnhe. 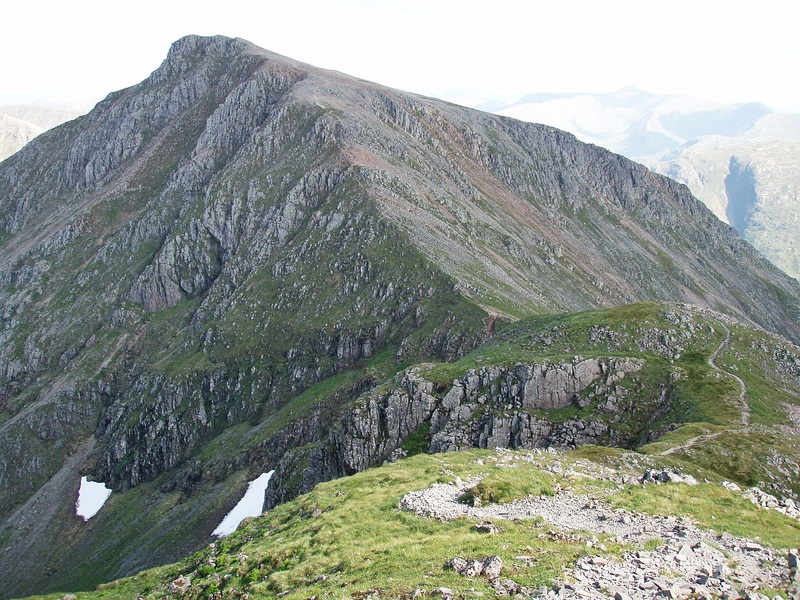 The second Munro Top Stob Coire nam Beith. 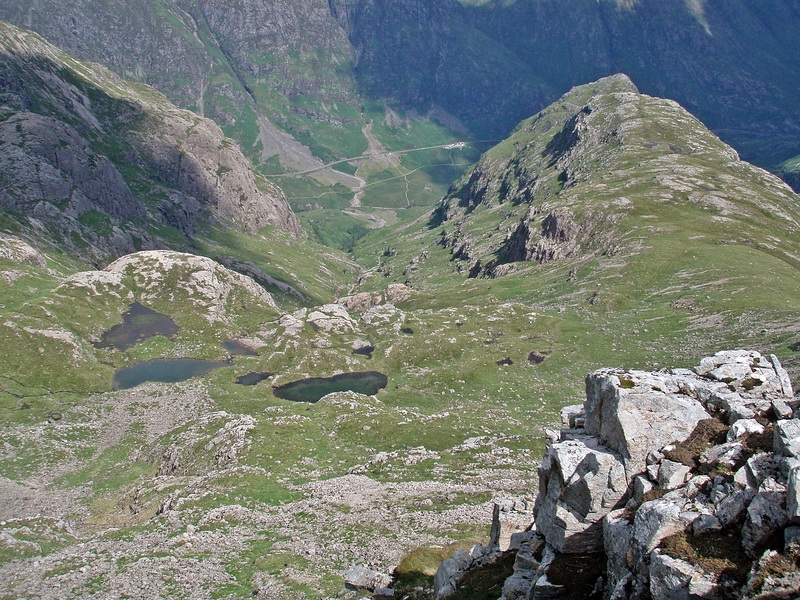 Crags and buttresses below Bidean nam Bian. 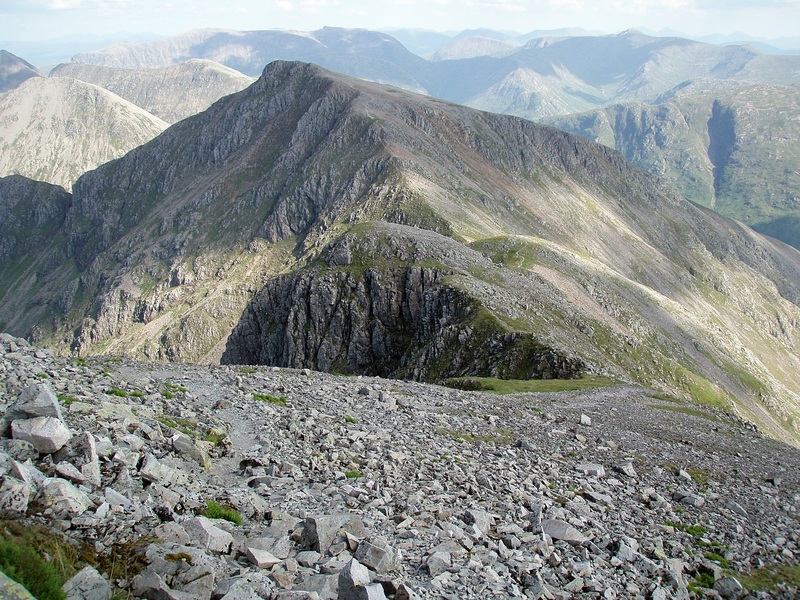 I passed the summit of Bidean nam Bian a second time and continued towards Bealach Dearg. 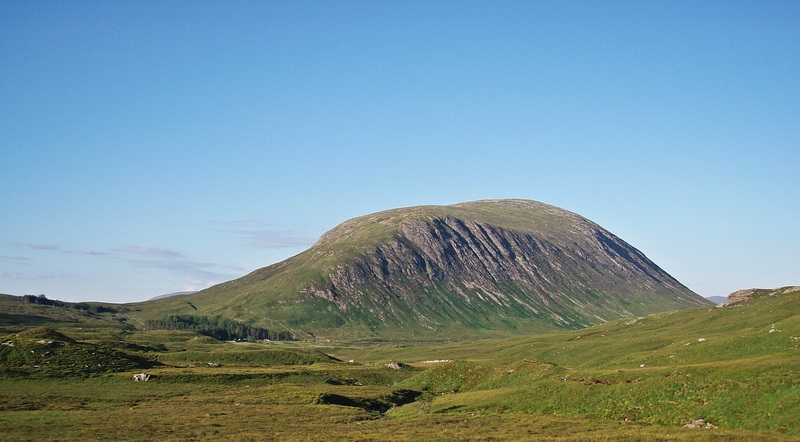 I had planned to include the Munro Stob Coire Sgreamhach and its two Tops, but it was already 16:15 and I realised I wouldn’t have enough daylight hours left. 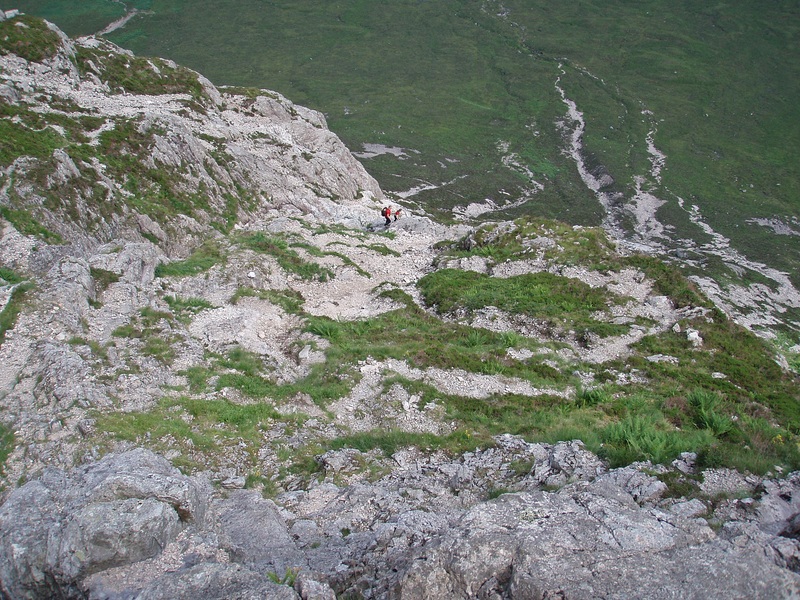 Coire Gabhail, my descent route. 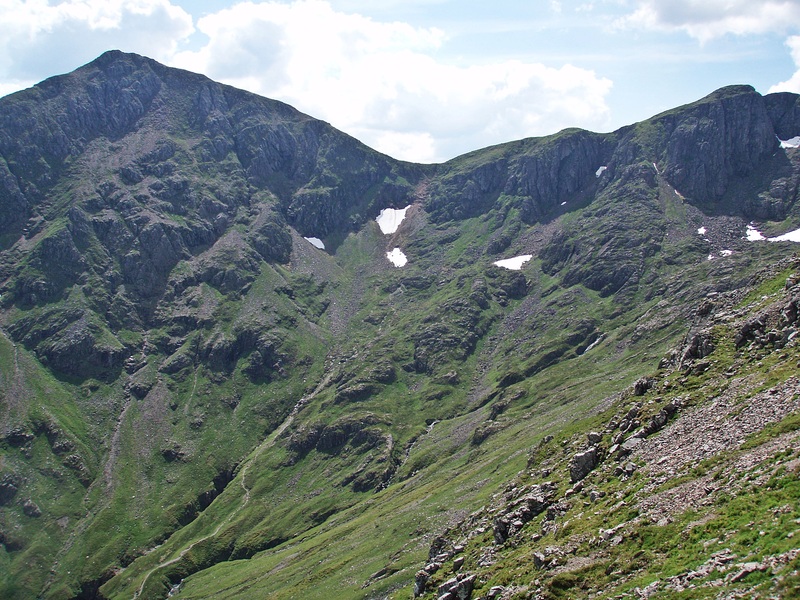 The two Munro Tops of Stob Coire Sgreamhach – they would have to wait for another day. 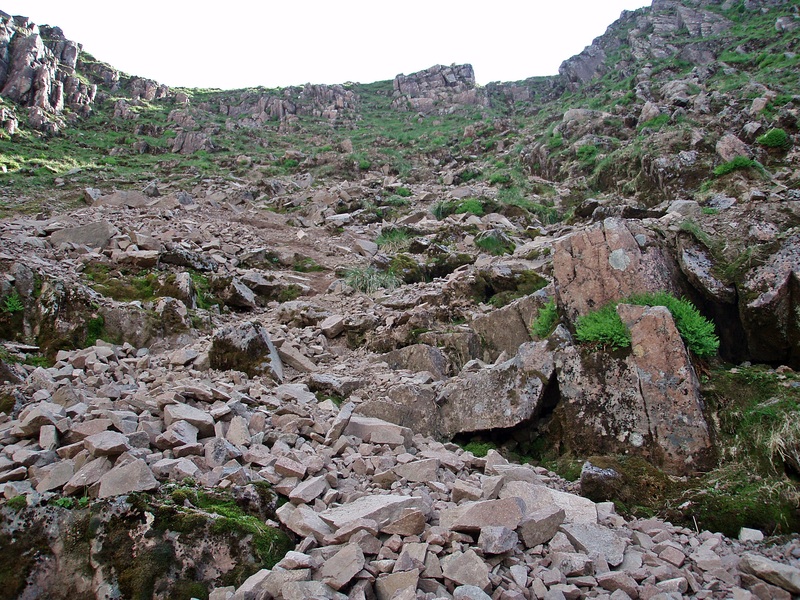 The start of the descent into Coire Gabhail is eroded and steep, so I carefully made my way down, holding on to the rocks on either side of the gully. 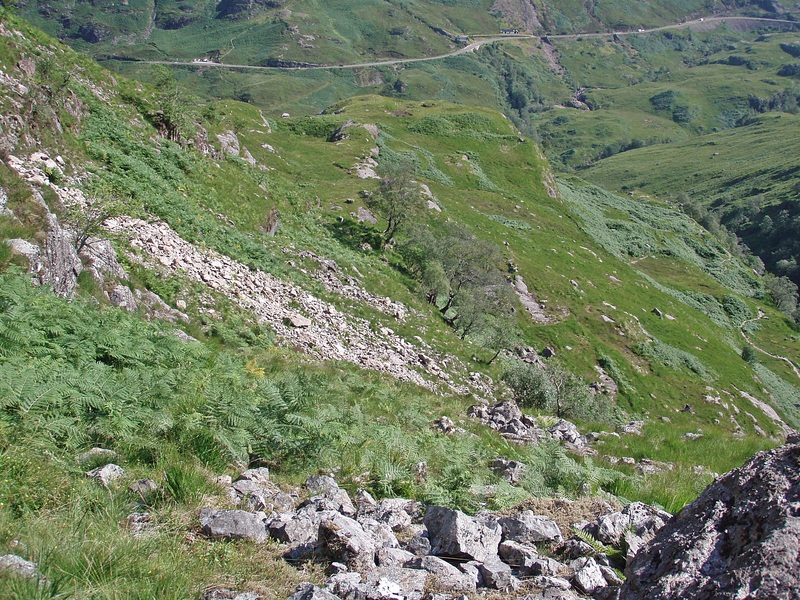 Looking back to the start of the descent route. 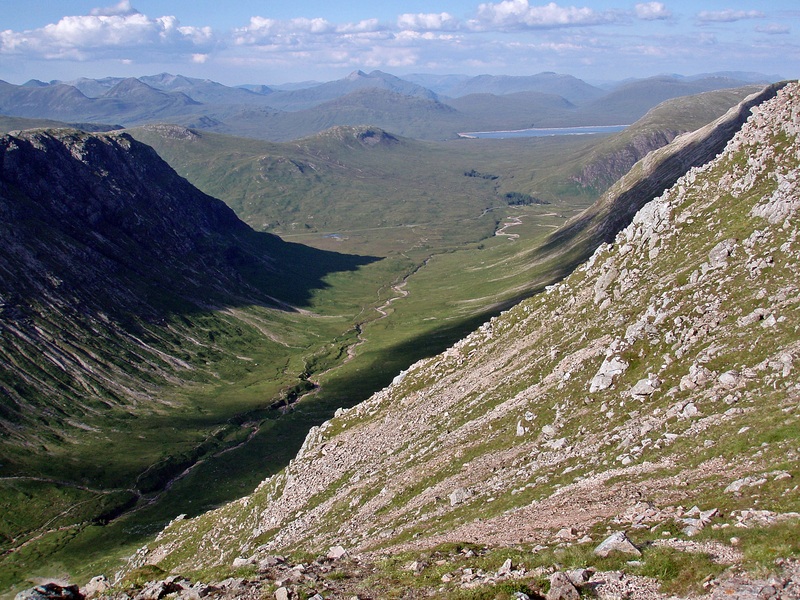 View back along Coire Gabhail. 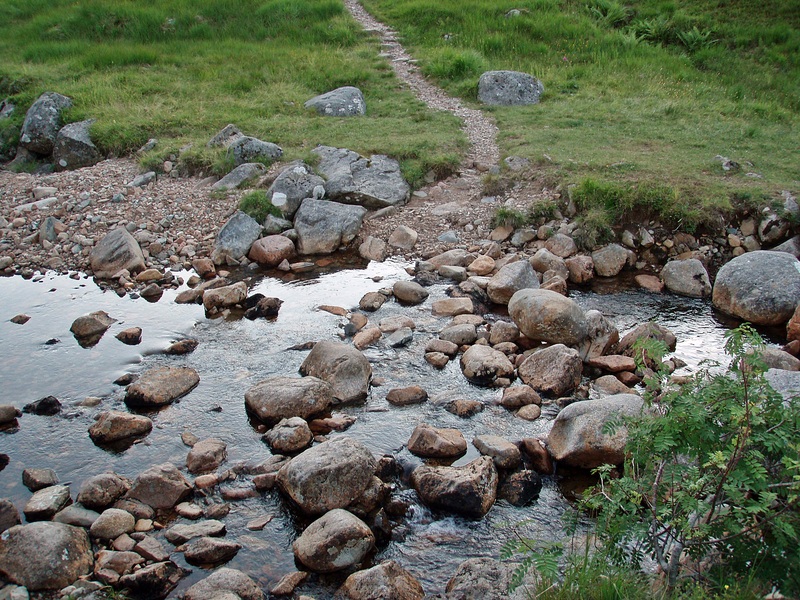 Further down the path there is one short rocky section to negotiate. 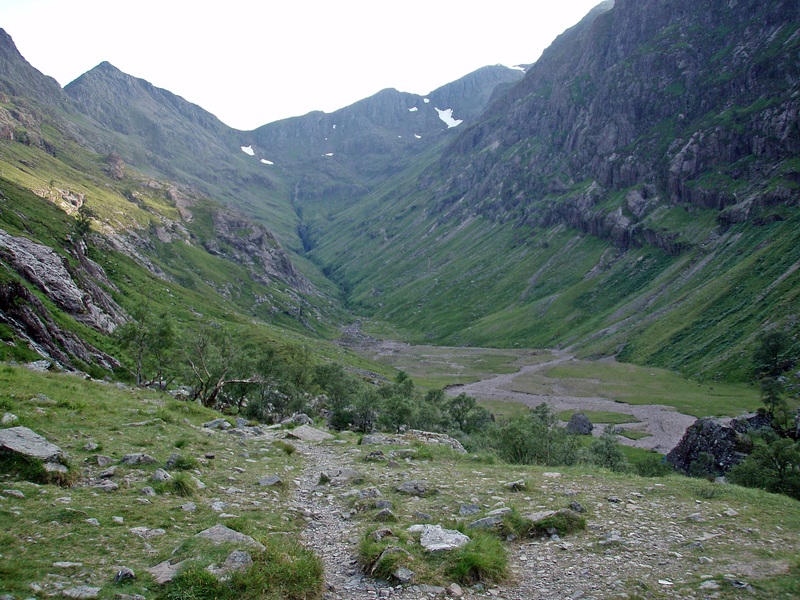 After fording the Allt Coire Gabhail I temporarily lost the path but eventually found it again (I suppose it’s obvious on the way up into Coire Gabhail, but I only ever used this path as a descent route). Evening sun on Geàrr Aonach. It was 19:45 when I got back to my car, and I was hoping I could still get a bar meal in Fort William. 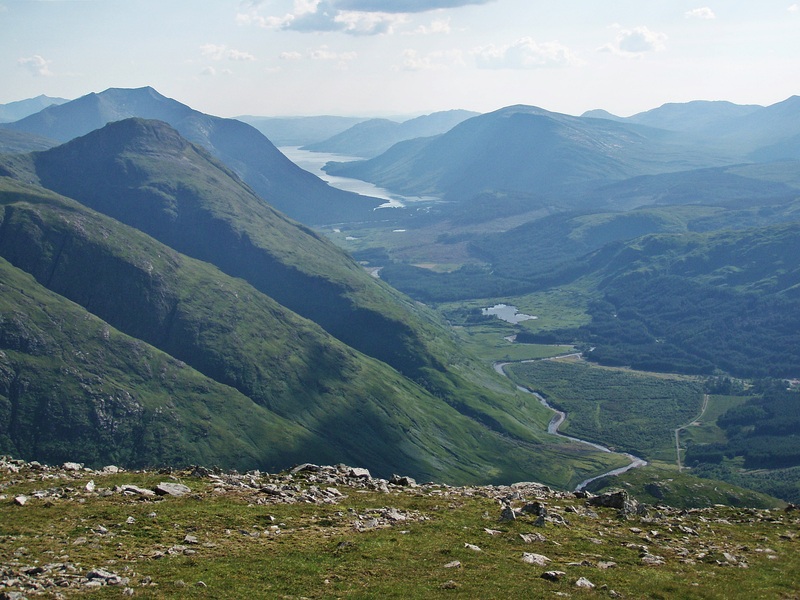 Although it was very late when I arrived at the Glen Nevis Restaurant (I had stopped in Ballachulish to freshen up a bit and to change clothes), I was lucky and they were still serving food. Stunning couple of days with wonderful photographs. Well done. I think i can safely say i wouldn’t have needed Exlax on day 1. 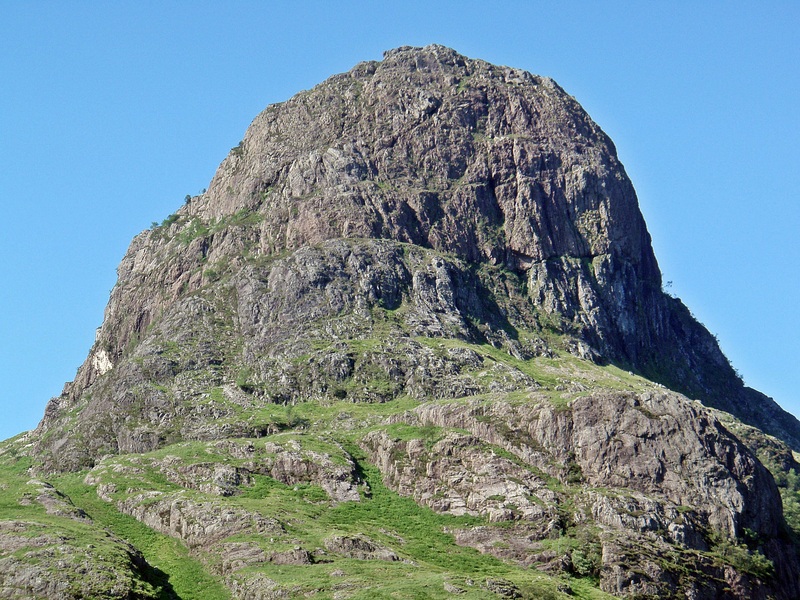 Hmmm – I’ve always wanted to do the Gearanach zig-zag but I’m not so sure now. 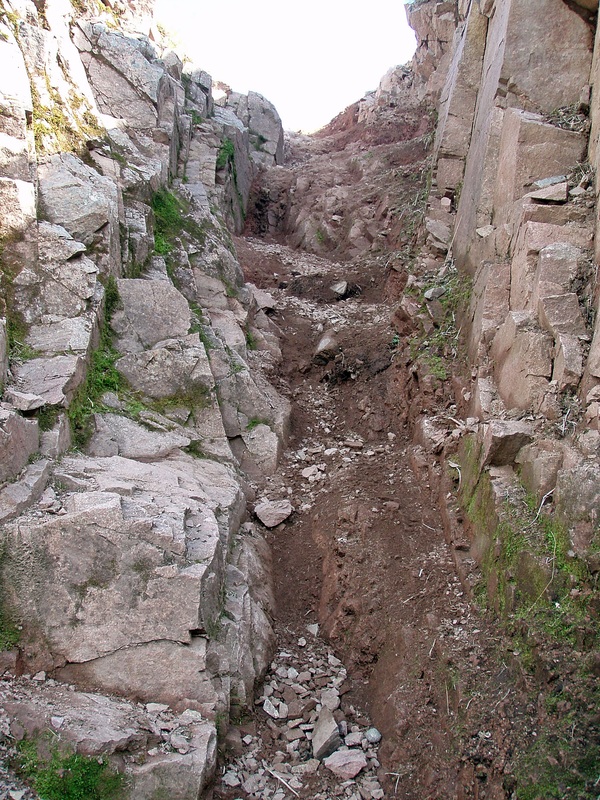 I appreciate it’s got a safe enough path but I might find some of it exposed. 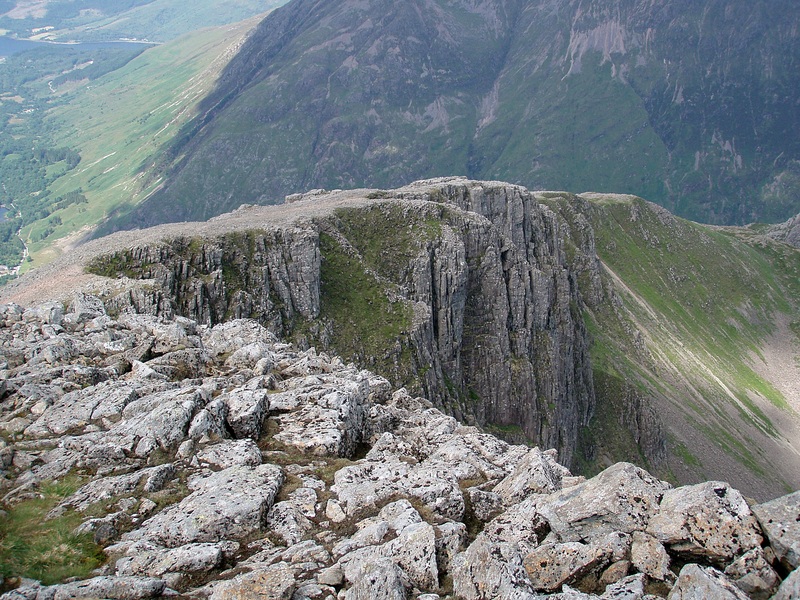 No idea how you did Curved Ridge on your own – I’d have needed both companions and a rope! 😮 Looks way out of my comfort zone that. I might go and have a look at the zig-zag though. 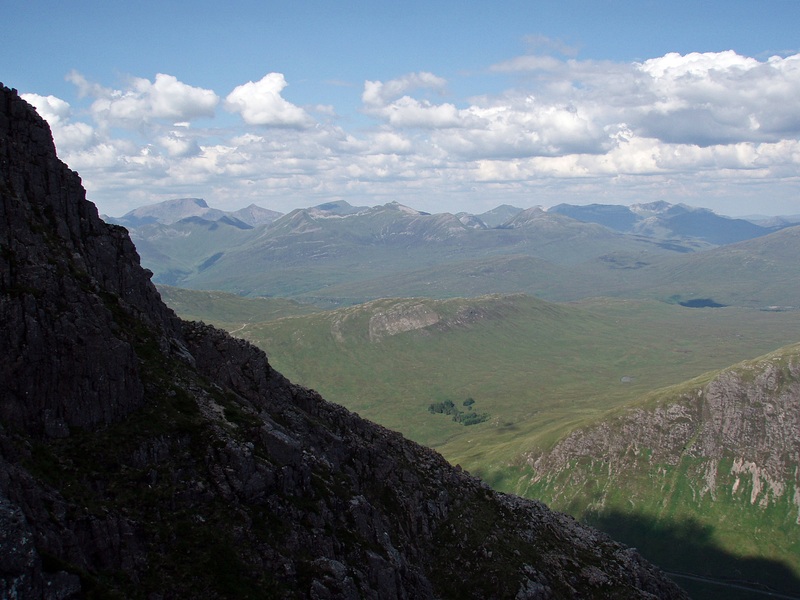 When we did Buachaille Etive Mor we went up via Coire Altrium as I wasn’t sure I’d like Coire na Tulaich. It was quite a good route. 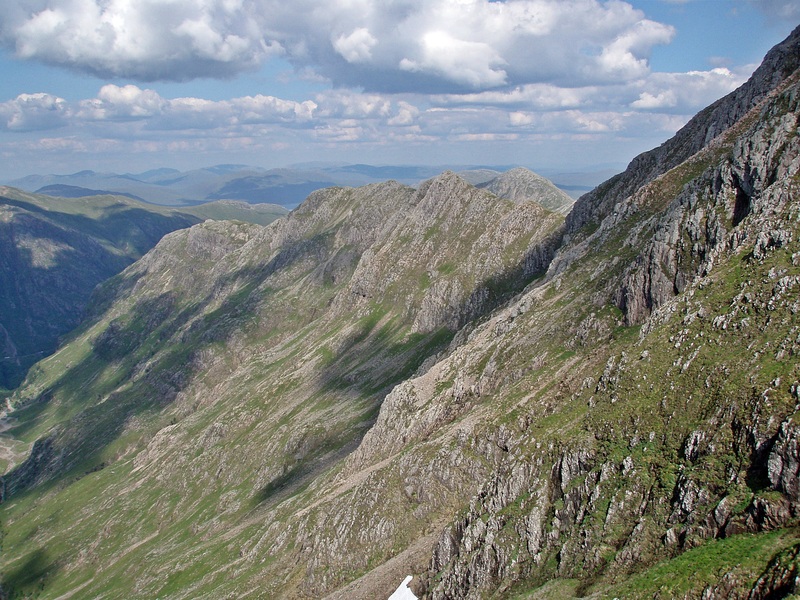 The North ridge of Stob Coire nan Lochan is easy and very pleasant. 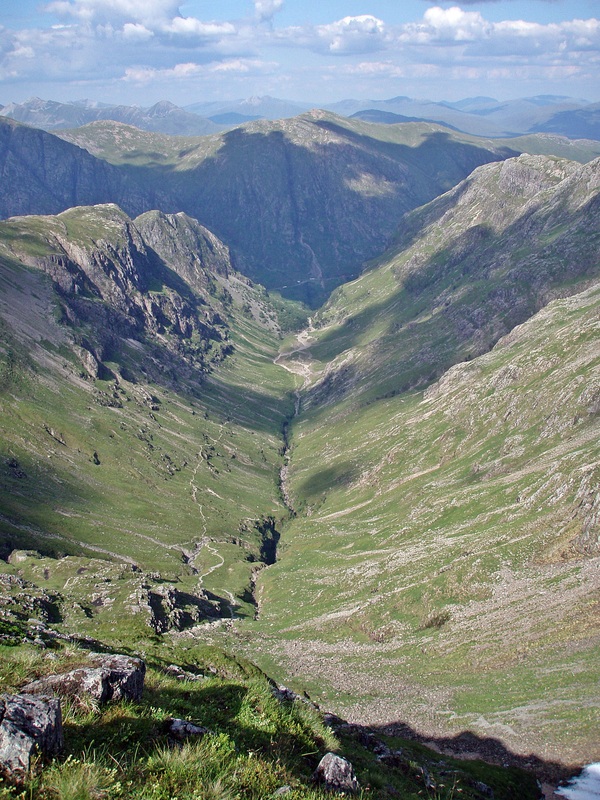 It’s then easy grass down to the normal descent route in the corrie. Another excellent report and very detailed photos – I’m jealous again now! 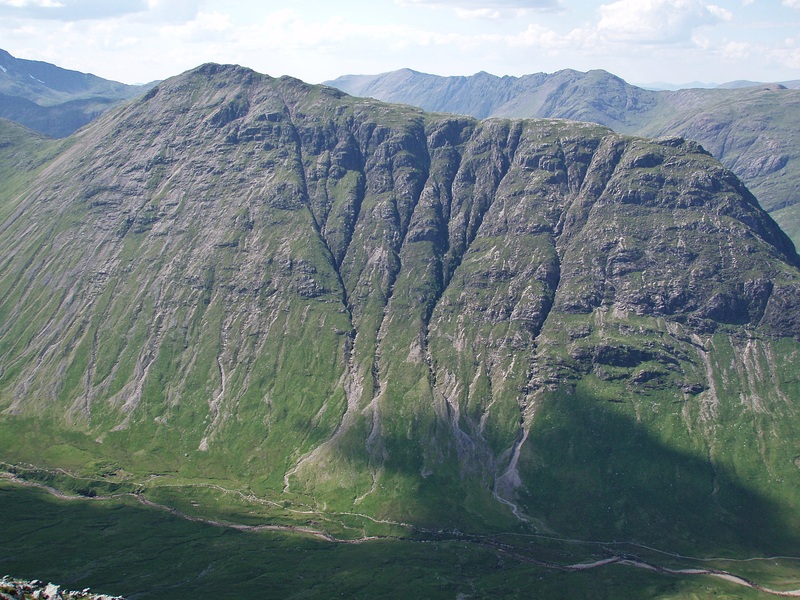 Curved Ridge is exposed, but I’m sure you would manage the Zig Zags no problem. 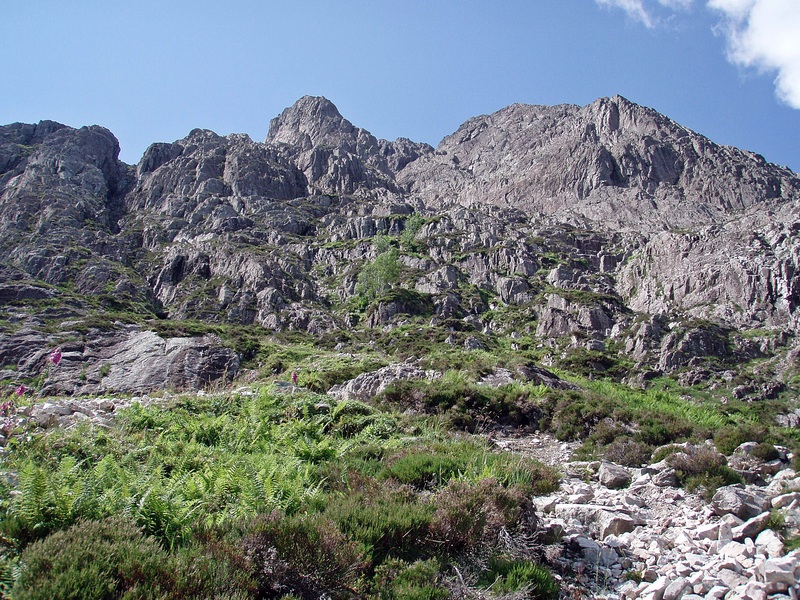 The scrambling sections are very short and not difficult, and the rest is really just walking on a narrow path. But it’s definitely worth it for the views! 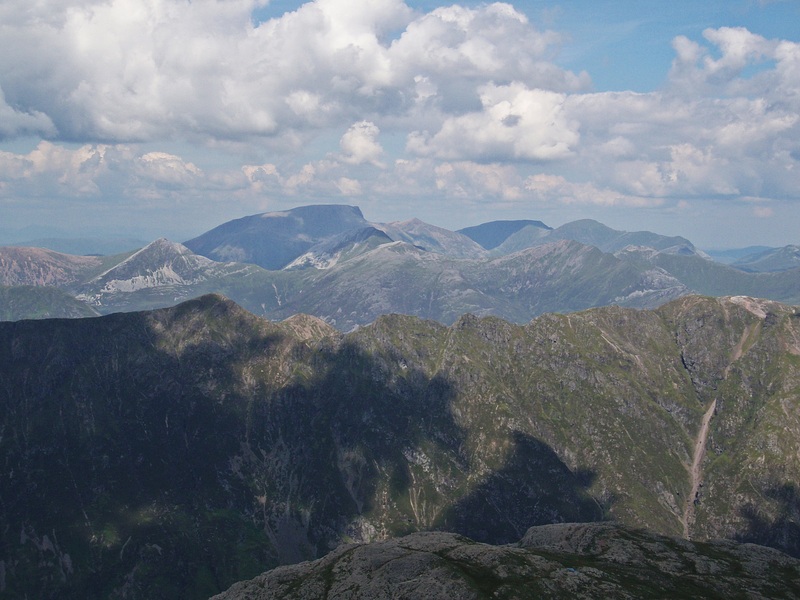 Another fantastic report with great pictures, just wish 2015 weather would hurry up an improve so I can get back out on the hills too : ). 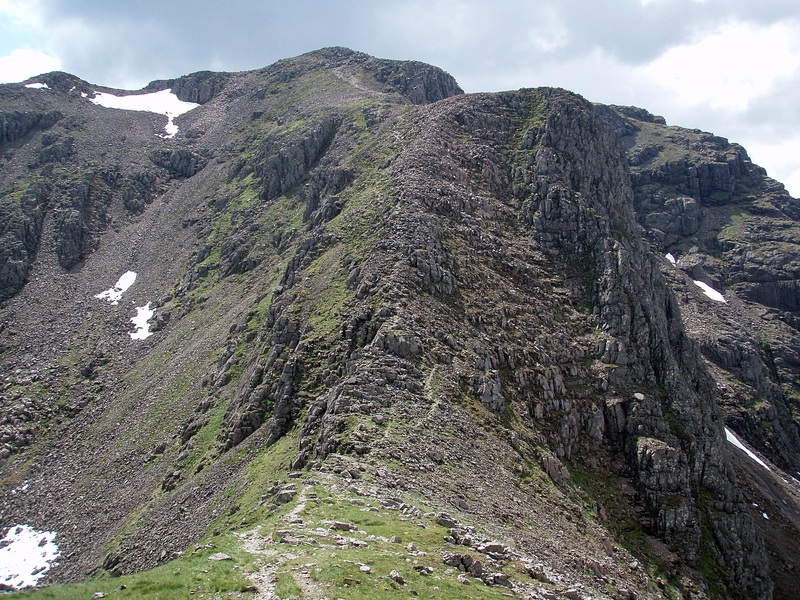 “Once past the scree it is important to traverse to the right as the continuation to the left leads to more difficult terrain and other climbing routes”. 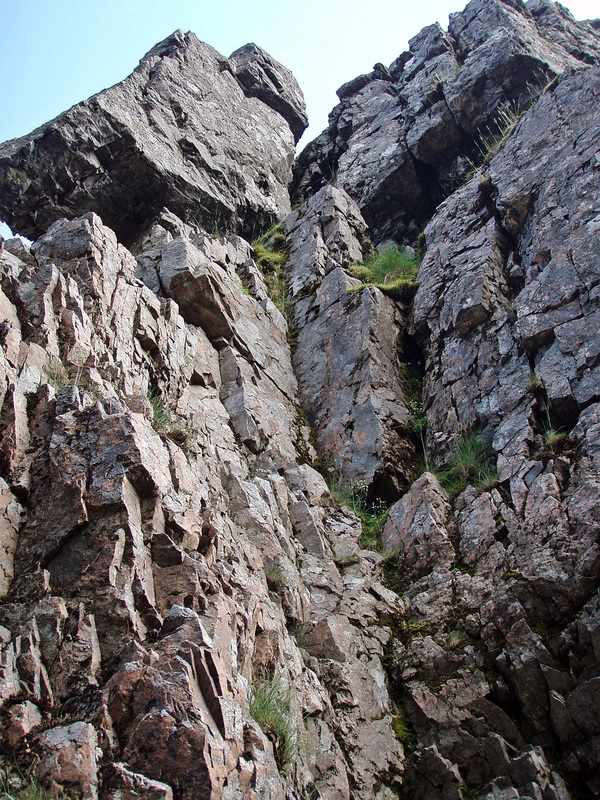 I made the mistake of keeping left and finished up climbing D Gully Buttress! 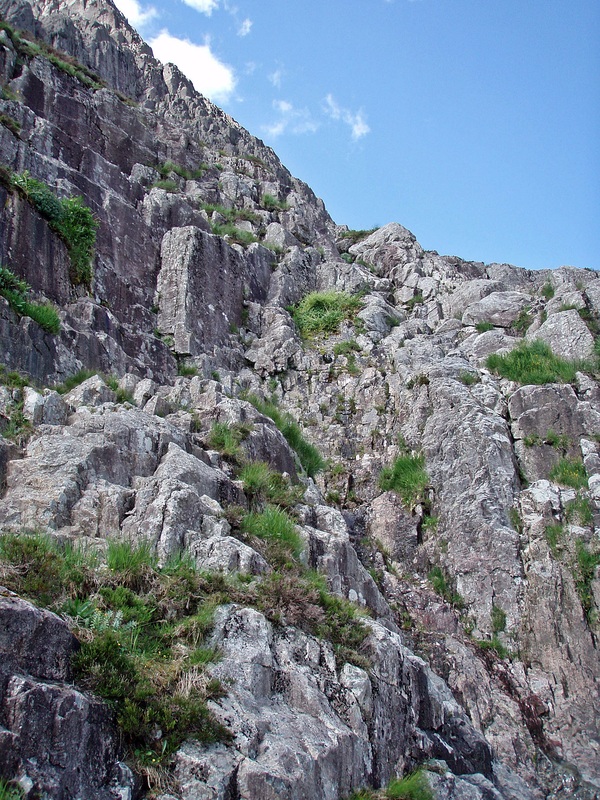 Excellent report and wonderful set of pictures that bring back happy memories of climbs and scrambles around there. 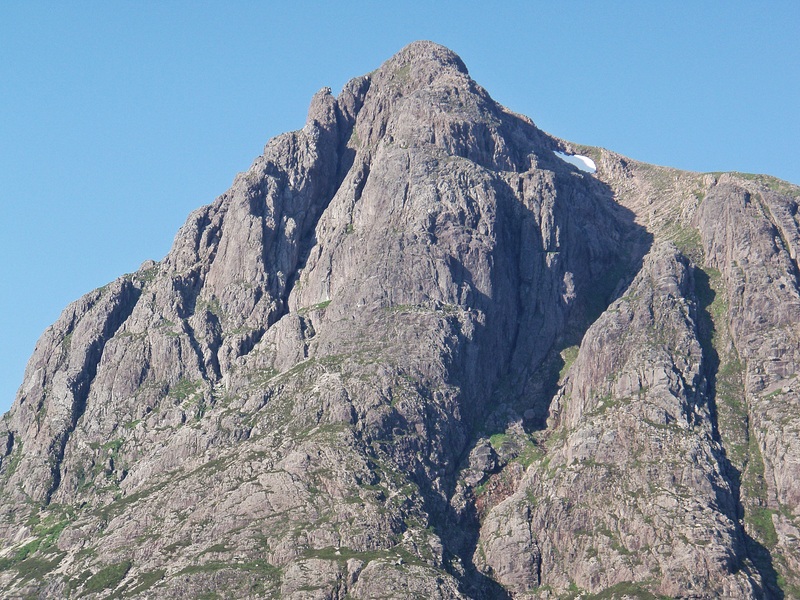 Notably, a hot summer day that started up Agag’s Groove, then lunch on Crowberry Tower and finished in the River Etive being pummelled and massaged under a crashing waterfall. Thanks for reminding me of it all…..
That sounds like a really great summer’s day with a refreshing bath in the river at the end. 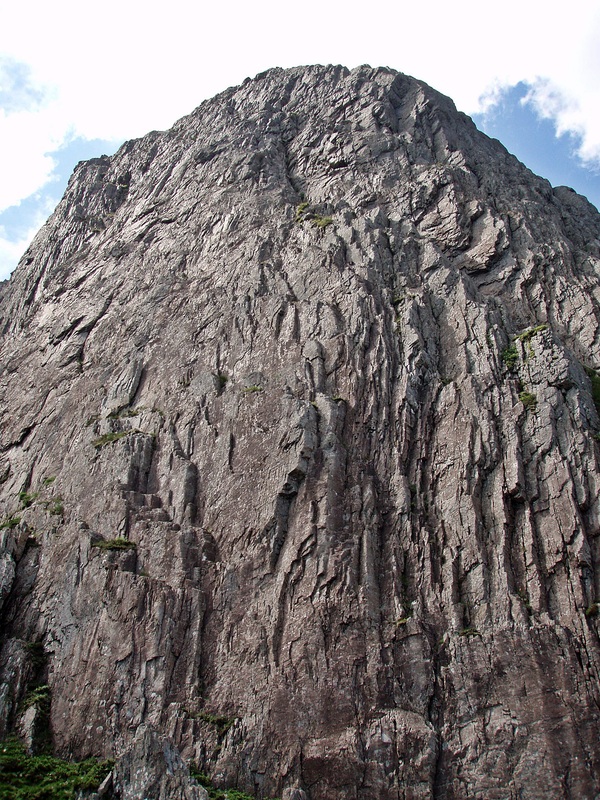 As for D Gully Buttress, I’ve heard of quite a few people who “accidentally” climbed it. 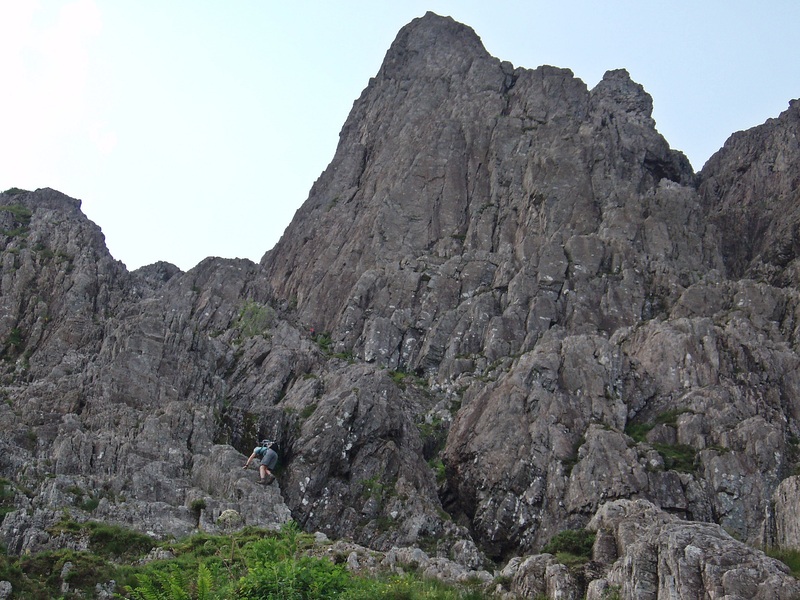 But you probably didn’t find it too difficult if you do rock climbs like Agag’s Groove? Great reads! Thank you. Afterwards and also for planning ahead for maybe a next trip to Scotland. Very inspiring as well as helpful!! Great report, really enjoyed reading and looking at all the photos !! 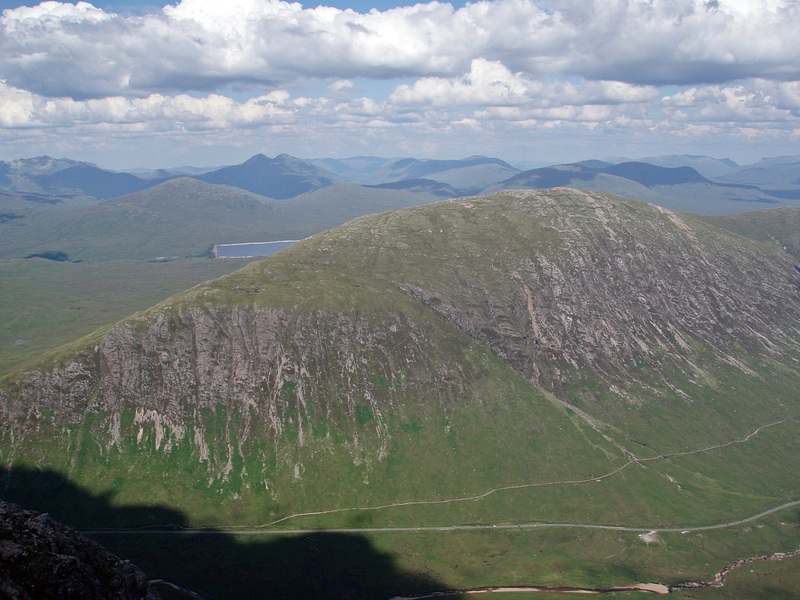 I have been up Buachaille Etive Mor last June via the walkers’ route (I wrote an article about it), what a fantastic summit to stand on !! 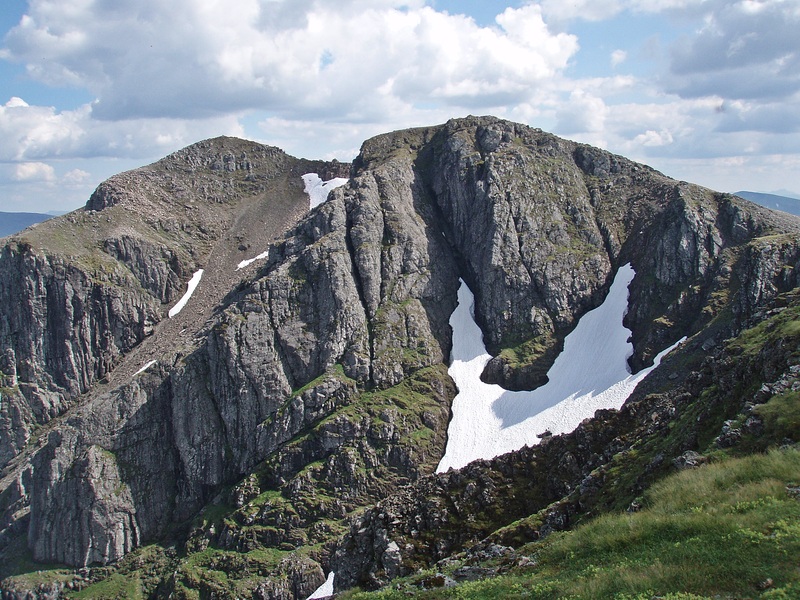 Being more a walker than a climber and doing most of my walks solo, I would not try and tackle the Curved Ridge, but I found some very useful information here about Gearr Aonach, which I was thinking of climbing as an approach to Bidean nam Bian and its neighbours. Thank you !! 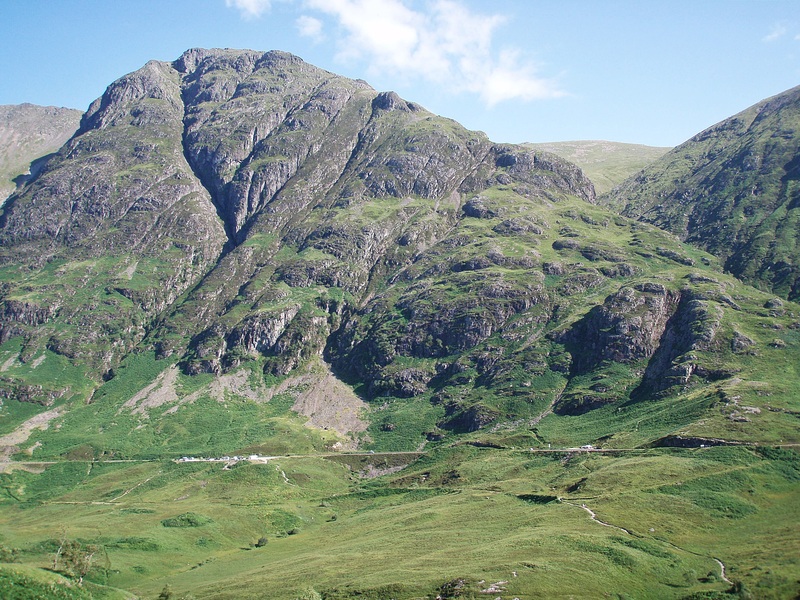 I hope you’ll have a great time on Bidean nam Bian and any other hills you are planning to climb, and I’m already looking forward to reading your trip reports!